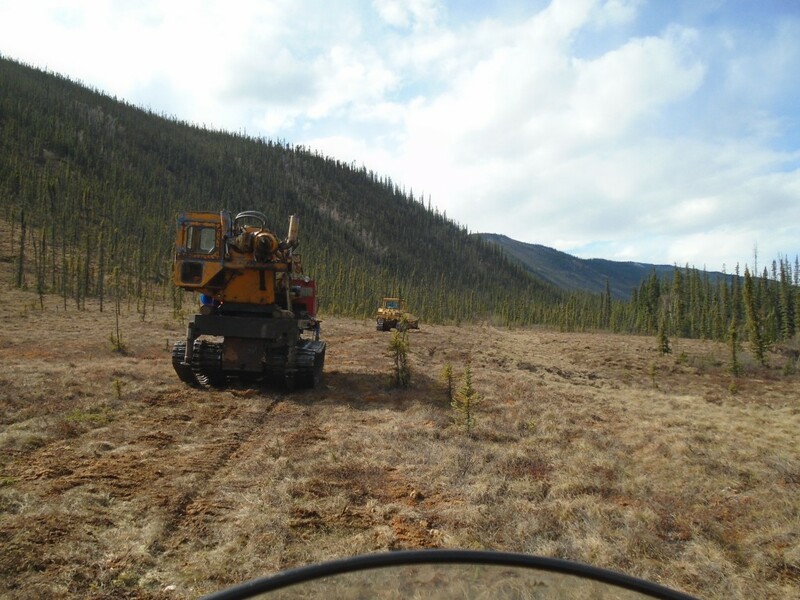 In the spring 2016 I was hired to help on a large scale placer exploration program in the Yukon. 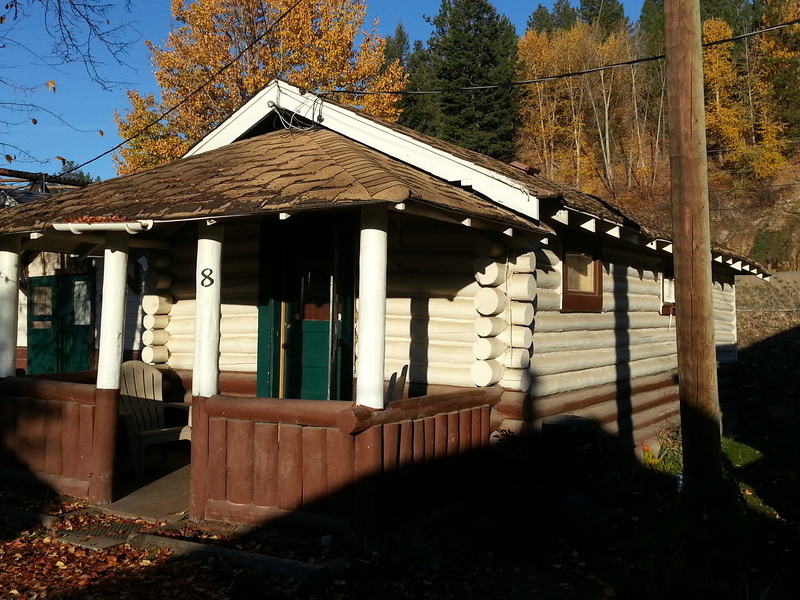 The property is located in a part of the Yukon where very little placer activity has taken place. We had a small team of three guys and a lot of equipment. 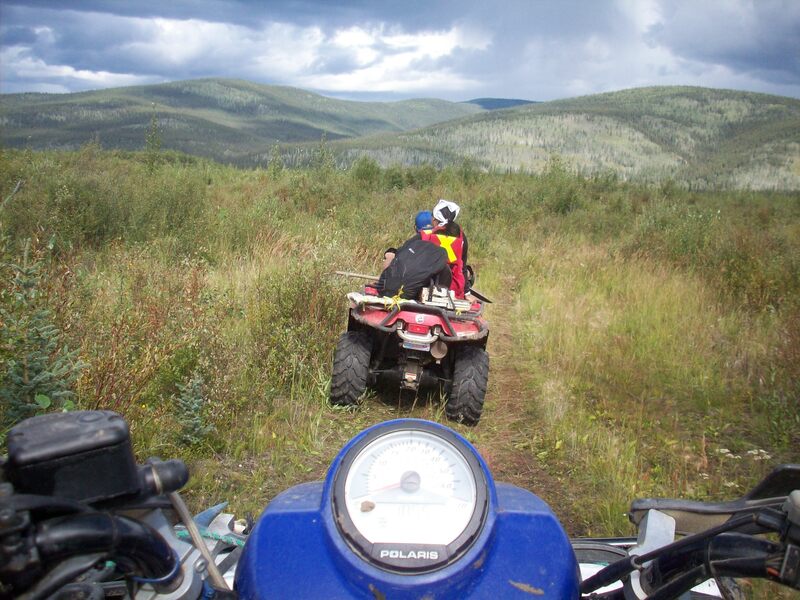 The Yukon, like BC and Alaska, was explored and settled by prospectors in the late 1800s. The Klondike gold rush of 1896-1899 was the largest and most storied gold rush in history. It is estimated that over 100,000 gold seekers migrated to the Arctic territory from places like San Fransico and Seattle. The Yukon’s economy is still driven by mining and the local culture is completely saturated with gold rush era influences. 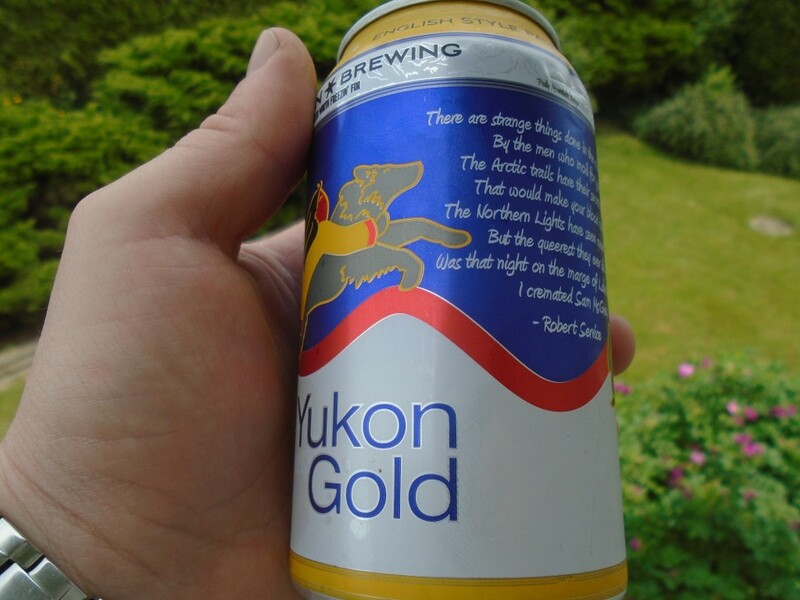 A great example is Yukon Gold, the flagship beer of the Yukon Brewing Company, has part the the famous poem “The Cremation of Sam Mcgee” on the label. The Robert Service poem is part of Canadian heritage and is part of the school curriculum across the country. After several trips prospecting in the Yukon it takes on different meaning than a quirky poem that you have to read out loud in grade three. On a Monday night in early April at 9PM I received a phone call. “Your flight leaves Vancouver in the morning for Whitehorse. We’ll fill you in on the way.” Typical for this kind of job. I had been expecting the call for a few weeks but it still caught me a little off guard. On arrival to Whitehorse I had been advised that one of our crew would meet me there. I had never met this guy before but I knew he was an old placer miner. The Whitehorse airport is small and we were the only flight. There were several people waiting for passengers so I had to guess. 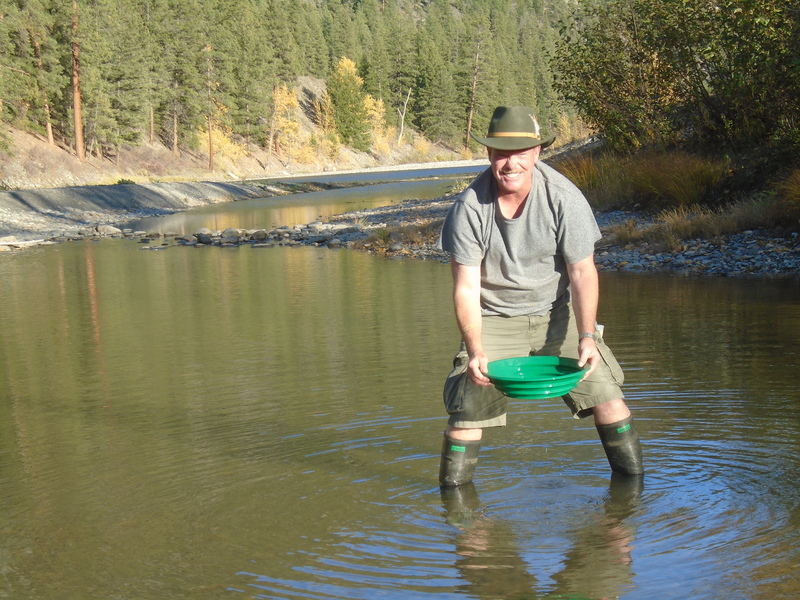 I noticed a guy wearing rubber boots and looked like a placer miner to me. I introduced myself and luckily he was the right guy. We spent a couple hours rounding up additional gear before catching the charter to the camp. 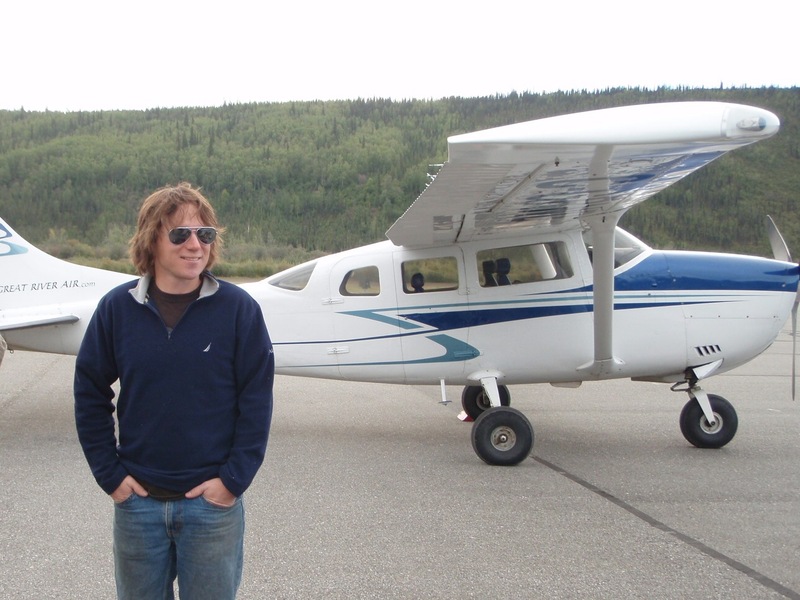 I was crammed in a Cessna 206 with the pilot and a bunch of gear. We had all the 5 gallon pails we could buy at the Whitehorse Home Hardware, drill bits, my gear, a 45 gallon drum of diesel, and a bunch of other stuff. 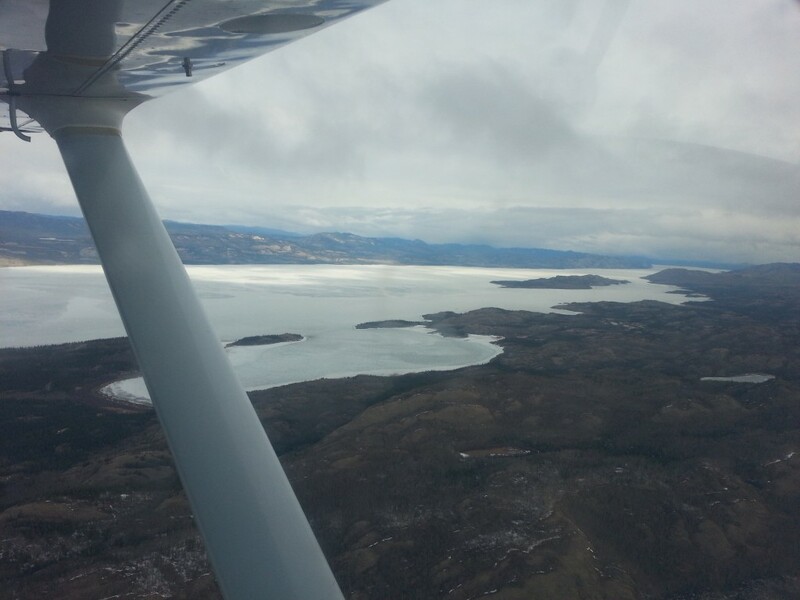 Soon after leaving Whitehorse we flew over Lake Lebarge which is the location where Sam Magee was famously cremated. The pilot warned me that the runway was a little rough. We took a couple passes and lined up to land. It was rough all right, made of gravel and ice, we bounced so hard that we almost took off again. My two crew members were waiting to greet me at the plane. They were excited to meet me, especially since I brought a 24 pack of Kokanee. The beer didn’t last the night. The two guys that I was working with had already been there for several weeks. It’s a rustic camp and there was no water available for showers or anything. I thought my team mates smelled pretty bad when I arrived but after a few days we all smelled the same. A few weeks later temperatures were high enough to rig up a pump system and a shower. This is not the first rustic camp that I’ve been to where we have satellite internet and no showers. These are interesting times to be an explorer. The camp consists of three canvas tents, a seacan and an outhouse. The tents have “hippy killer” stoves that burn wood. They work well most of the time but you have to chop wood every time you want heat. Wood floors had been constructed which is certainly a luxury over dirt floors. Our kitchen is in the same tent as the office. There’s a propane stove/oven and plenty of food. We used paper plates so we wouldn’t have to wash them, they worked great for starting the stoves when we were done with them. The main goal of this program was to carry out a sampling over the property. 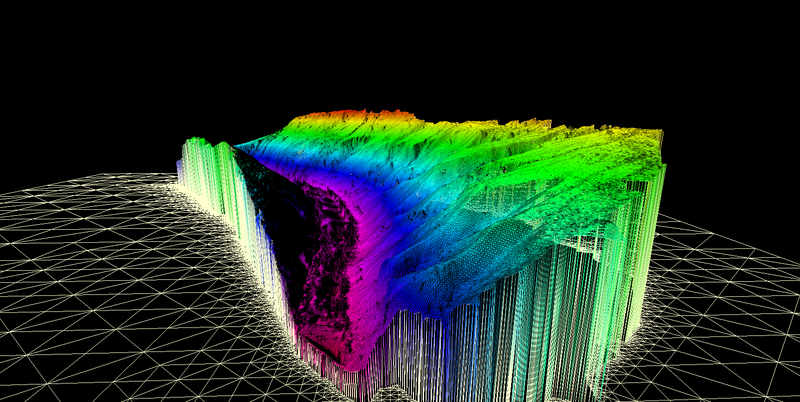 The drilling and sampling will allow us to find and evaluate economic placer deposits. 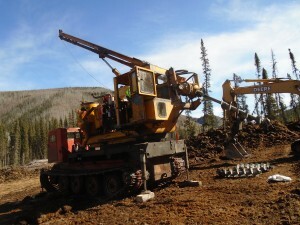 Our primary tool was a Nodwell mounted drill with a 12″ auger. Some areas were sampled by excavator where the ground was not suitable to drill. Material was collected with the drill and excavator and processed on site with a small wash plant. 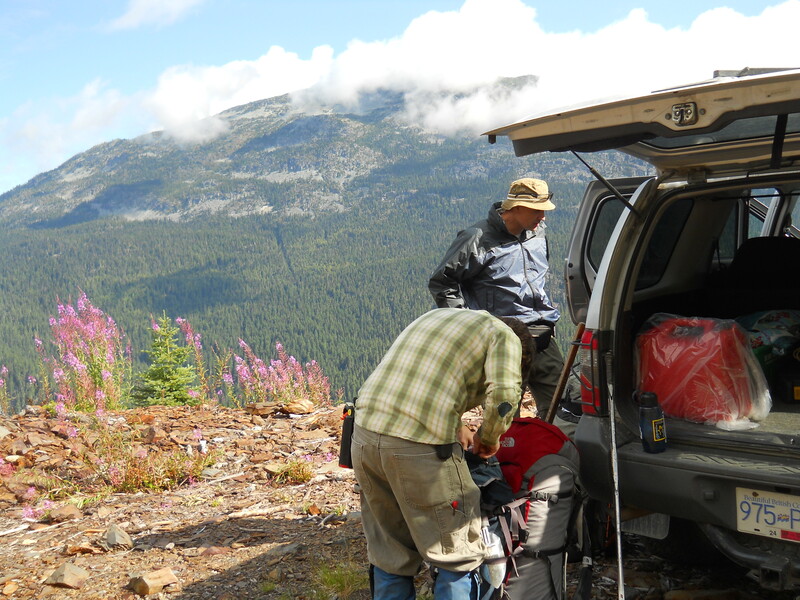 In addition to gold values we developed an understanding of bedrock depth, characteristics and the distribution of placer gold. Most of the gear was brought in on the winter trail. 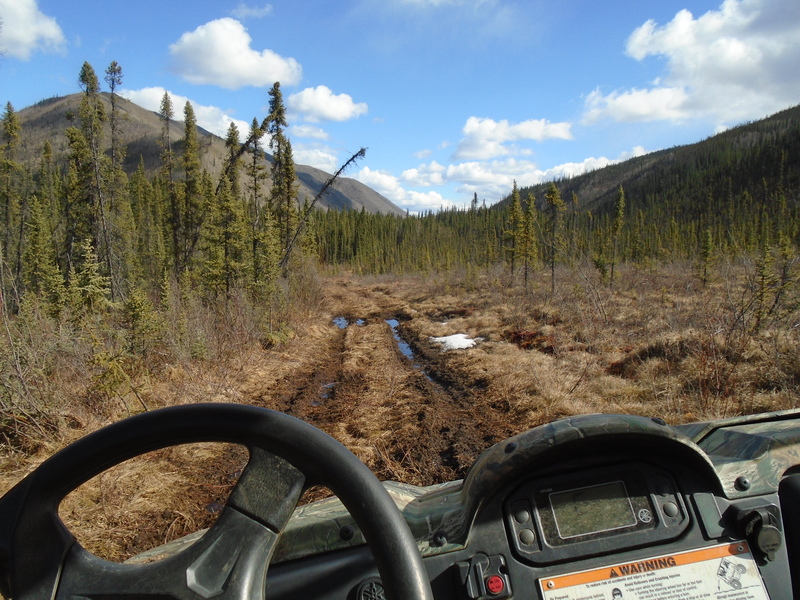 The trail is about 100km from the closest dirt road and requires the ground to be frozen and snow covered. Our two Nodwells, Toyota track truck, quads, fuel and everything was brought in over the trail. With a light load it can be travelled by snowmobile in about 4 hours each way. With the heavy equipment it takes 3-4 days. 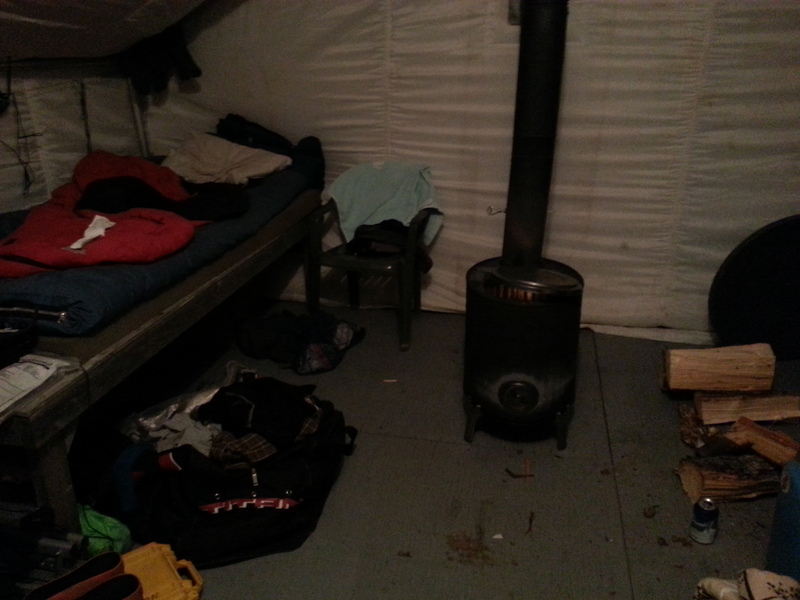 There are impromptu camps along the way but nothing with heat and very little shelter. The guys were prepared of course. Nodwells are pretty cool machines. 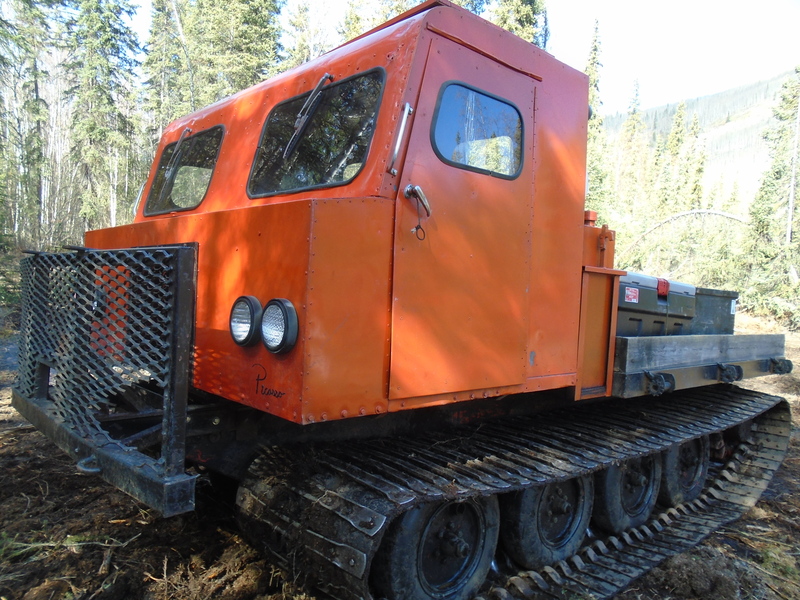 They were invented in the 1950s to service the oilfields of Northern Alberta and the Arctic. 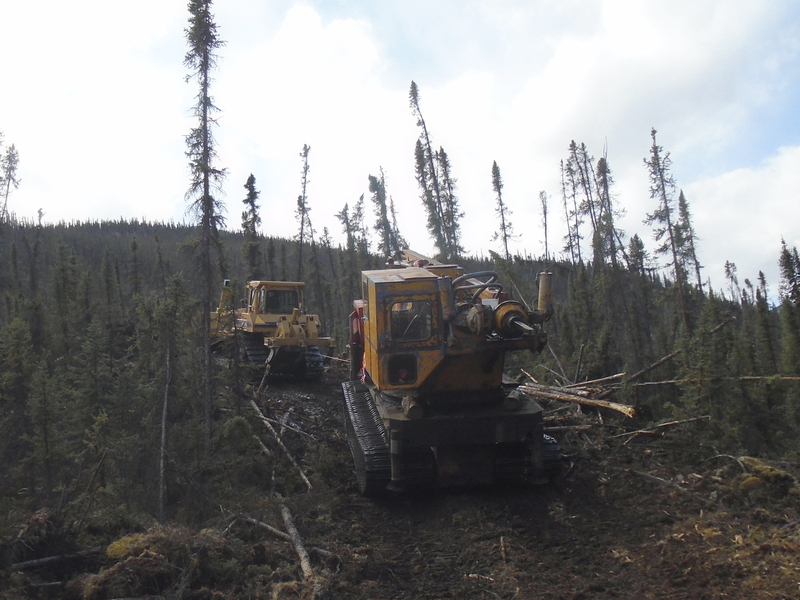 These beastly machines have super wide tracks to spread their weight on soft terrain. They have a unique drive system that uses rubber tires on the track. Operating one is similar to driving a tank. You pull levers to brake the track on either side. We had two of them, a big Nodwell for the drill and a smaller one for a support vehicle. 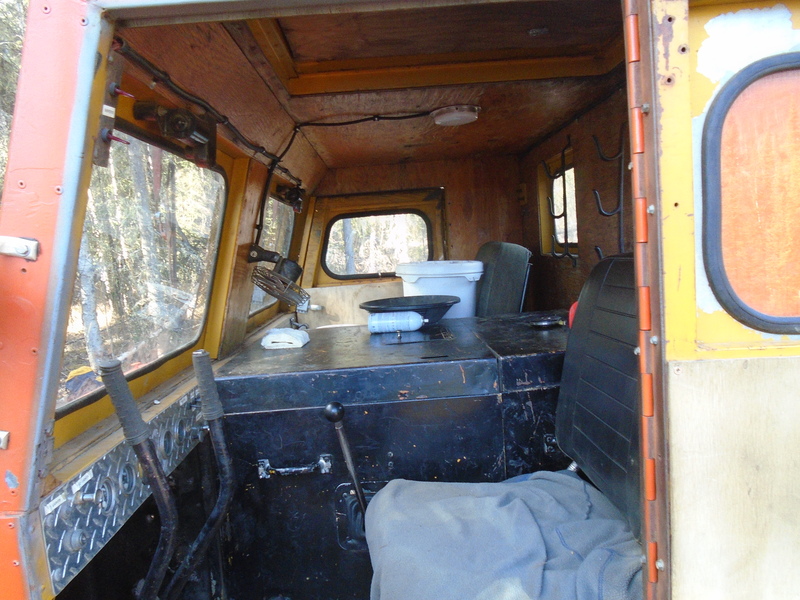 The Nodwells have a lot of character, check out the yellow plywood interior and gun rack. The small one is named “Picasso”. The photos will expand when clicked. 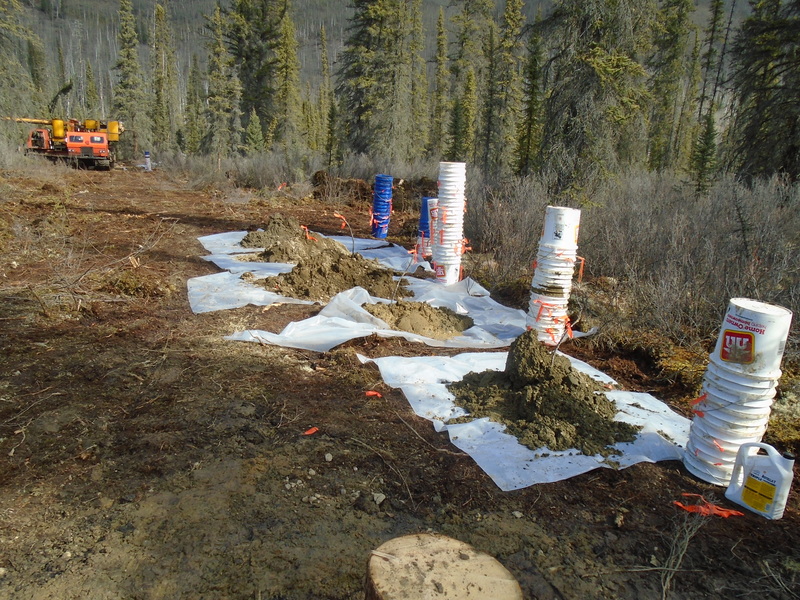 We located and mapped several trenches that were used for ground sluicing dating back to the 1898 Yukon gold rush. The old timers diverted the creek to flow through hand cut trenches. 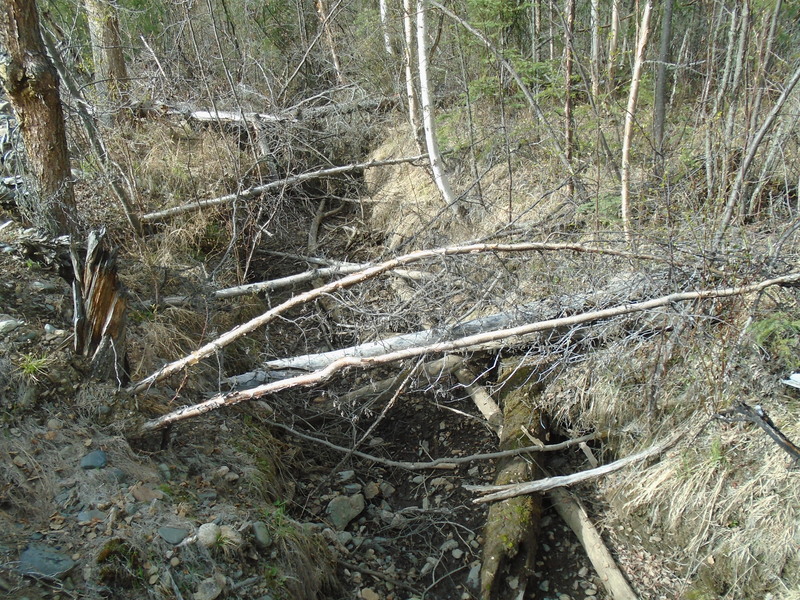 The water was then controlled via a series of gates to strip away overburden. Sort of like hydraulicking. There’s not much left of the old workings today but it gives us an idea of where the pay streaks are. 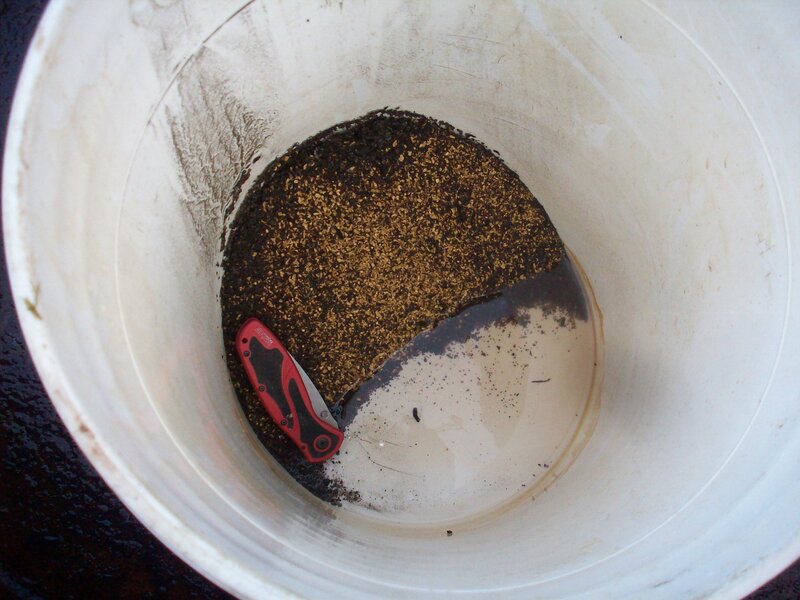 Sampling is key to any placer operation. 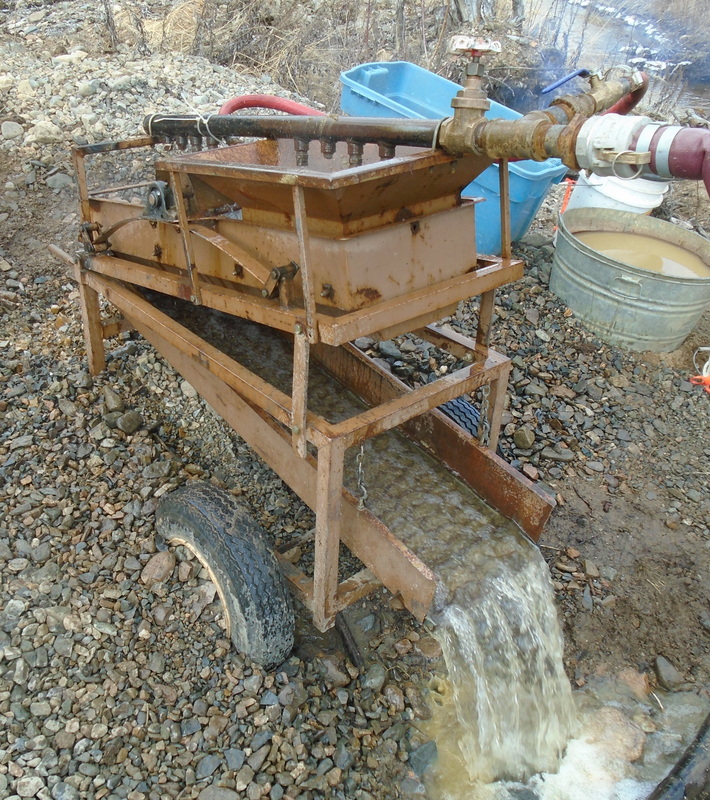 Sloppy or inadequate sampling spells the death of many mining operations. After all you wouldn’t get married without going on a date first. 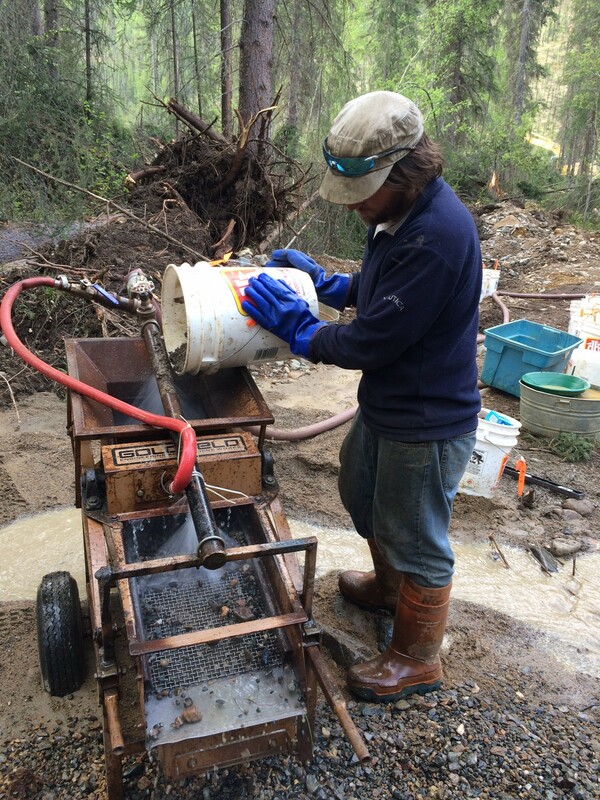 We collected samples with a rugged 12″ auger drill. Each sample had a set depth interval and a measured volume. With accurate measurements we can extrapolate the sample data to evaluate the deposit over large areas. For example if we sample 500mg (1/2 gram) from 10 pails of material, that equates to just over 3 grams per cubic yard. We did have some just like that, and better. After collection by the drill our samples were run through a mini wash plant. We were using a cool machine called “The Prospector” by Goldfield Engineering. The Prospector uses a water driven pelton wheel to create a vibration. That’s awesome because all it needs is a 2″ pump to run. The wheel rotates an eccentric weight similar to the way the a cell phone vibrates but on a larger scale. Using this machine I processed over 15 cubic yards of samples over 7 weeks. The Prospector really eats through material. The shaker screen breaks it up almost as fast as you can feed it. It struggles when there is a lot of clay though. After each sample interval is run a cleanup is necessary. With this machine it’s a quick procedure. The concentrates from each sample are panned out with a gold pan. The gold is then dried out and weighed to be used in grade estimates. As the summer solstice approaches the days get longer in the Yukon. In the summer the sun does not set in the Arctic it is after all the land of the midnight sun. The lack of darkness takes a little getting used to. 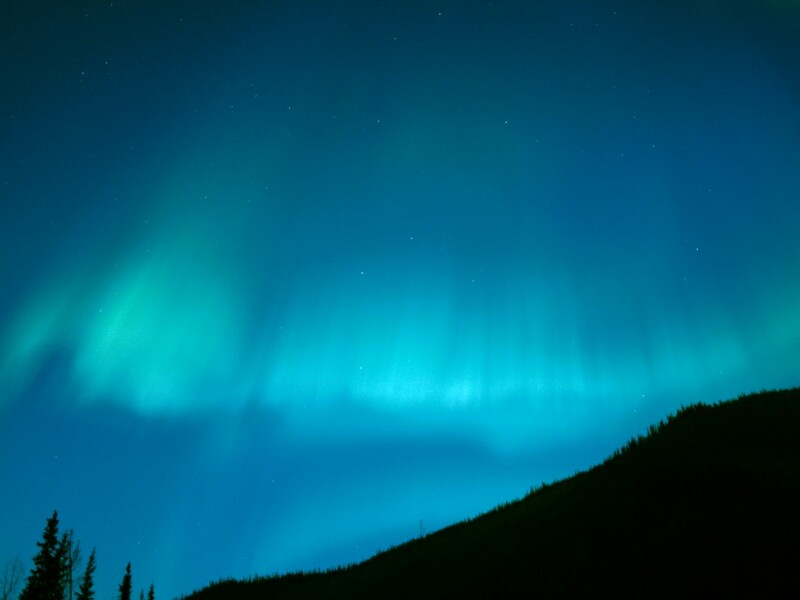 In early May we had a couple of Northern lights shows that were pretty good. At that time there was about 2 hours of darkness where the Northern lights were visible. A week later it would no longer be dark enough. We encountered few animals on the trip. 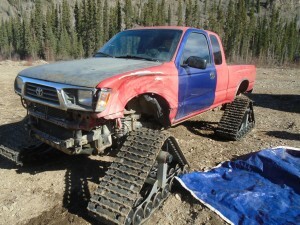 This is described as a “hungry” part of the Yukon. One bear tried to enter our camp. It was a very large black bear, the electric fence slowed him down but it took a few bear bangers to scare him off. A huge mangey wolf casually pranced right in front of us one night. All the animals are big in the Yukon. 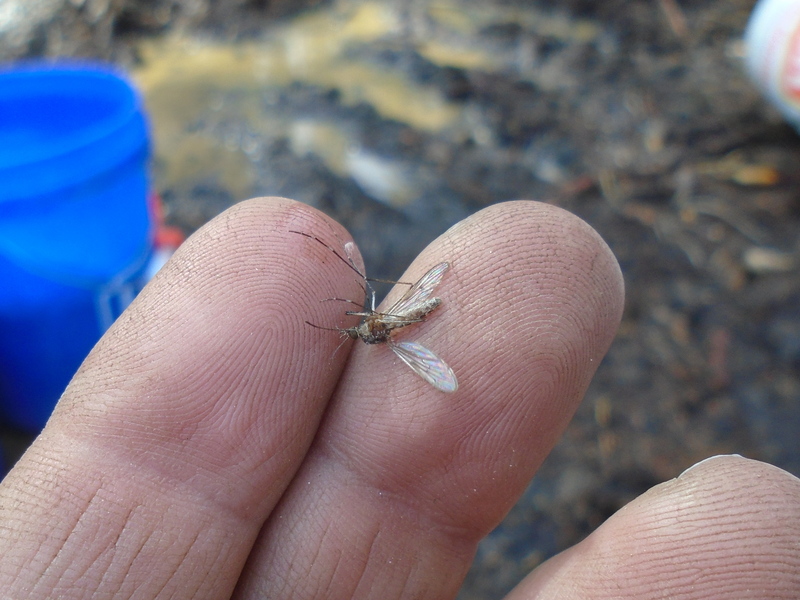 Even the mosquitoes. They are so big that they often get up and fly away after you swat them. Unless you are willing to really smack yourself in the face, they are not going to die. For some samples we had to use the excavator. 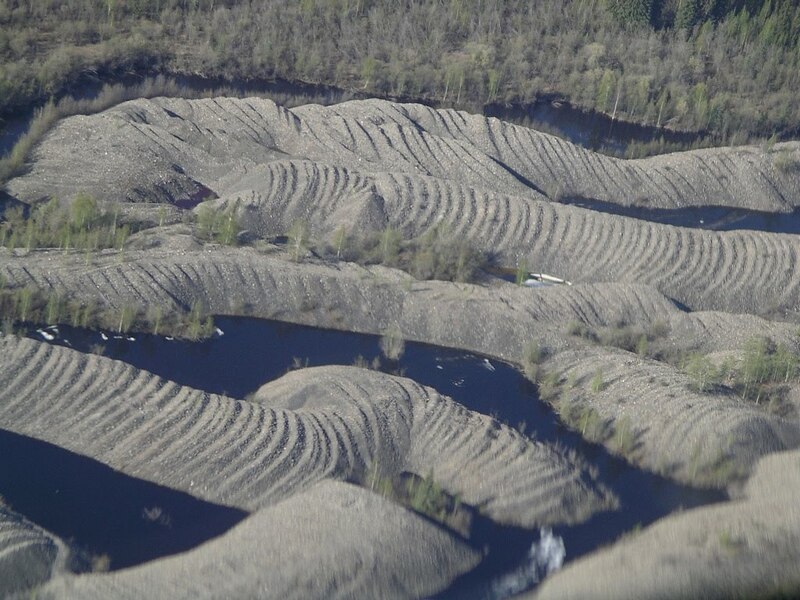 The auger drill does not work well in areas where the permafrost has melted. We tried a few spots and the mixture of water and loose gravel would not stay on the auger flights. The excavator does not have that problem since it scoops up a bucket full of material, water and all. We used a huge 4″ pump to drain the holes first then sampled the bedrock and regolith with the hoe. The samples were of course put into pails and we measured the volume before processing. We had a few other machines to help out as well. 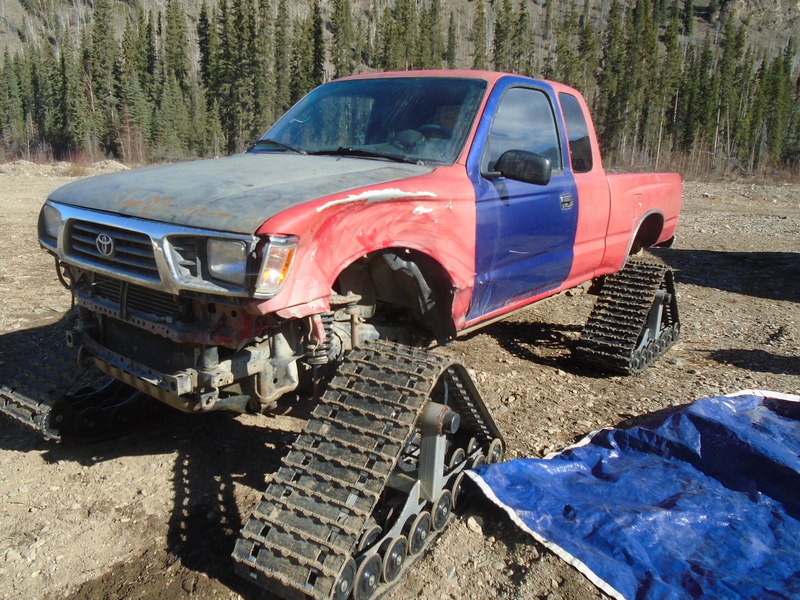 A couple of bulldozers, some quads, a side by side and a ’96 Toyota pickup with tracks instead of wheels. We took the tracks off once the snow was all gone using the hoe to lift the truck. Why bother with jacks when you have those Tonka toys kicking around. The winter trail conditions rapidly deteriorated as the weather warmed up. The ground here is like muskeg with lots of water and mud. Just about everything got stuck at some point, except for the Nodwells. We had to cross a few creeks, mud and sometimes straight trough the trees. The pursuit of gold will make men do strange things. 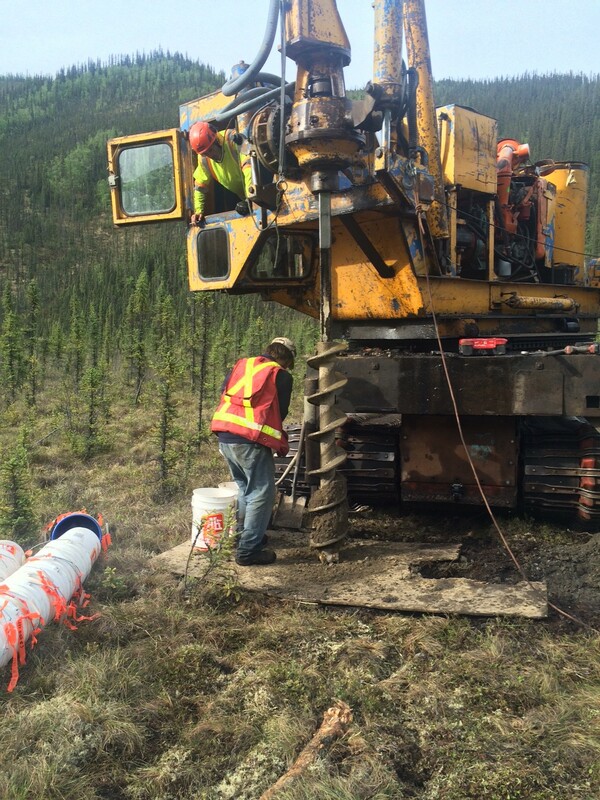 In our case it involved a ton of work travelling over unforgiving terrain to drill holes down to bedrock. Our persistence and determination paid off though and we discovered a pay channel that extends over much of the drilled area. It is going to take some more work to map out the full extent but we already have clear evidence of a great deposit. After 50 straight days it was time to go home. Our ride out was a DHC-3 Turbo-Otter, an impressive aircraft designed by de Havilland, a Canadaian company, in the 1950s. The Otter took our whole crew and all our gear without any issues. 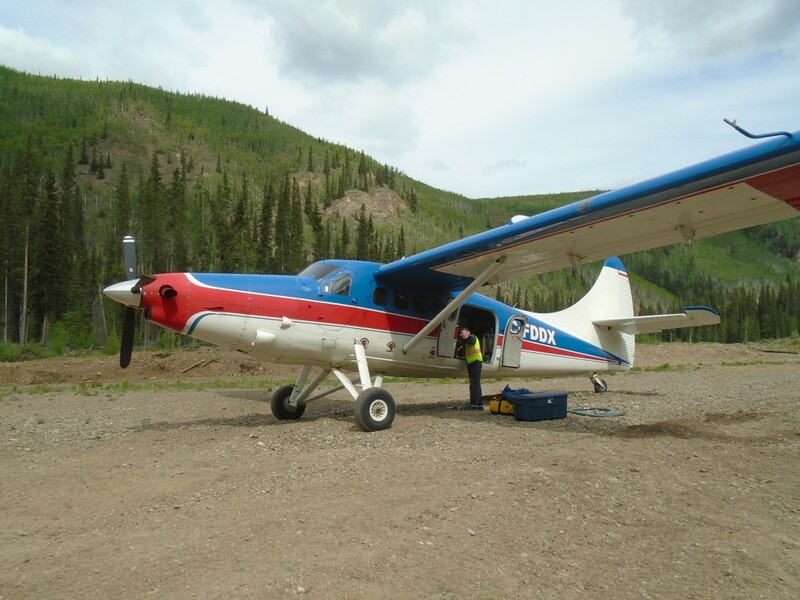 The turbine engine gives it the STOL capabilities to takeoff and land in a rugged bush airstrip like the one in this camp. We stopped along the way to drop off one of our guys and pick up some much needed beer before landing in Whitehorse. I had a wild night in Whitehorse to close off the trip before heading home to BC. It was a good time in the bush but it is nice to return to the comforts of modern civilization. 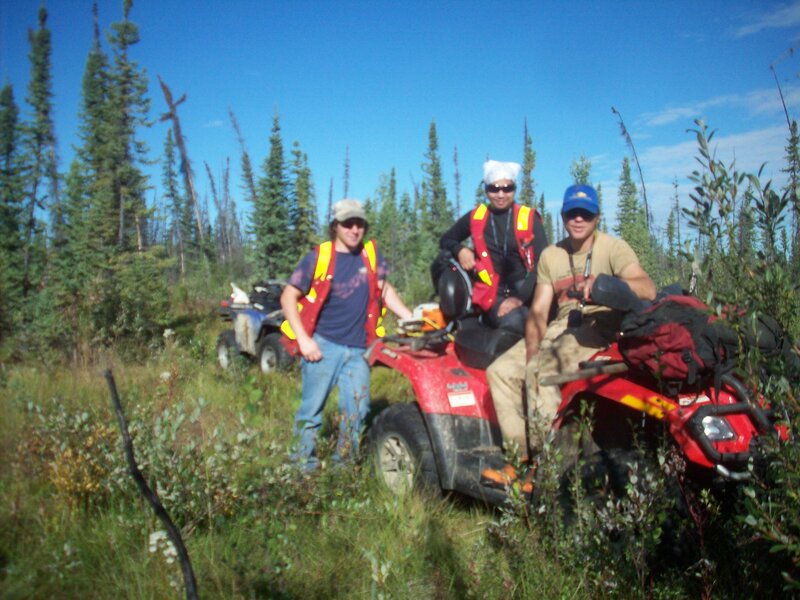 In the summer of 2010 I was hired to work with a team to find hard rock gold in the Klondike. We explored a group of claims on the Indian River. My crew stayed at a camp operated by a character called Big Al. That name might sound familiar because he has been featured on the popular TV show Yukon Gold on the History Channel. Of course at that time we had no idea he was going to be a celebrity. During the trip we heard a rumour that Hoffmans working a few claims over were filming for a TV show, it turned out to be the hit series Gold Rush on Discovery. We were surrounded by gold mining TV stars but didn’t know it yet. The Klondike is a place that has a very storied history and was the site of the greatest gold rush of them all. California, Oregon, and British Columbia had their gold rushes and stories but the Klondike was like no other. Between 1896 and 1899 over 100,000 adventurers made the journey from all over the world to the largely uninhabited Yukon territory in search of gold. What made this rush different is the long journeys and overall inexperience of the Argonauts. At the time of discovery El Dorado and Bonanza creek were the richest creeks in the world. Some claims on El Dorado were getting $27 to the pan once they hit the pay streak. That is equivalent to about $750 per pan in today’s money. 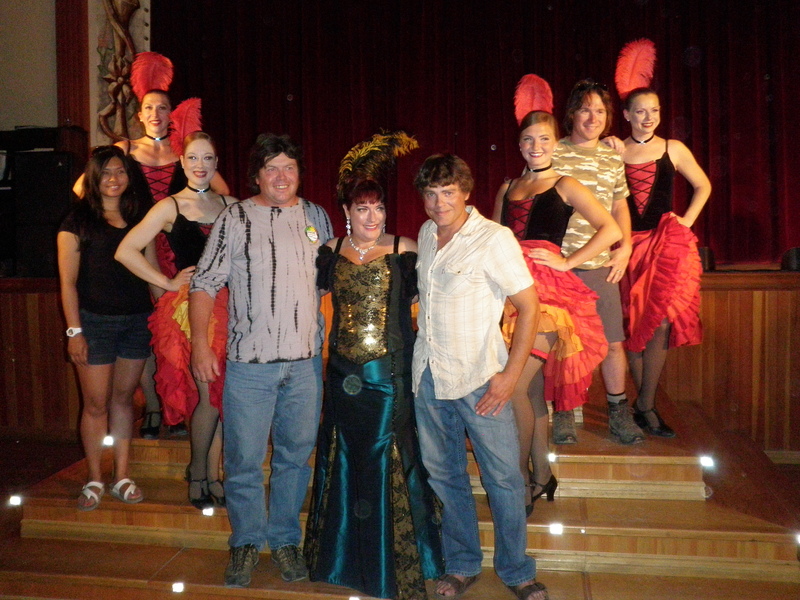 My team met up in Whitehorse the capitol city of the Yukon Territory in early August 2010. 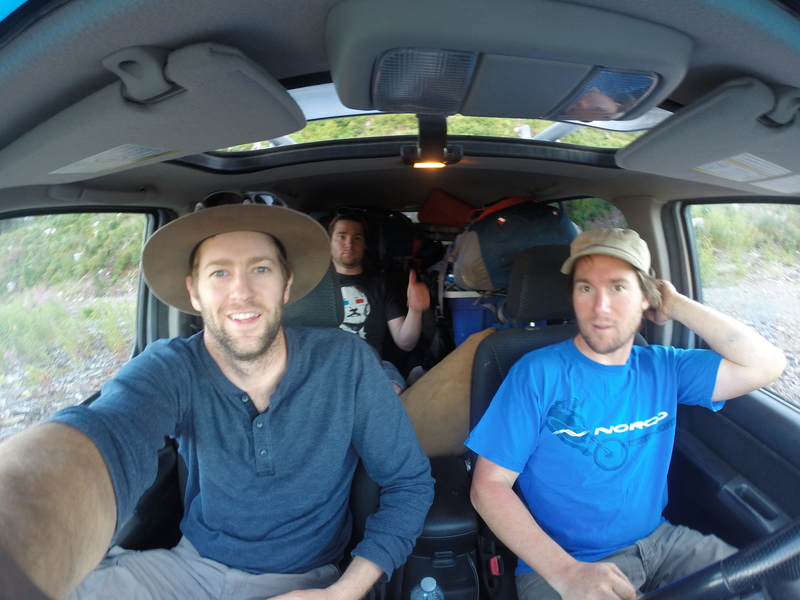 We then rounded up some remaining gear and drove in a rented truck up to Dawson City. 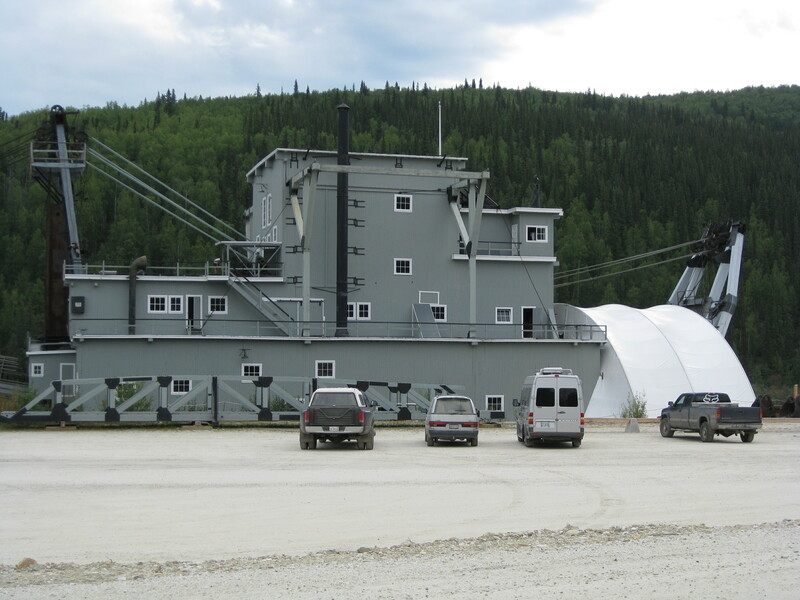 As you arive in Dawson City you can see the remains of over 100 years of placer gold mining. Before you reach the town you can see large tailings piles lining the sides of the highway. When looked at from above they look like something that was produced by a giant insect. 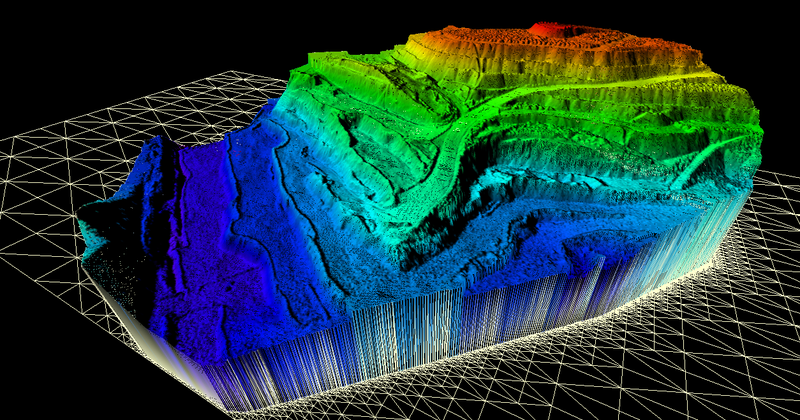 The tailings piles were put there by humongous dredges that scoured the Klondike drainages until 1966. 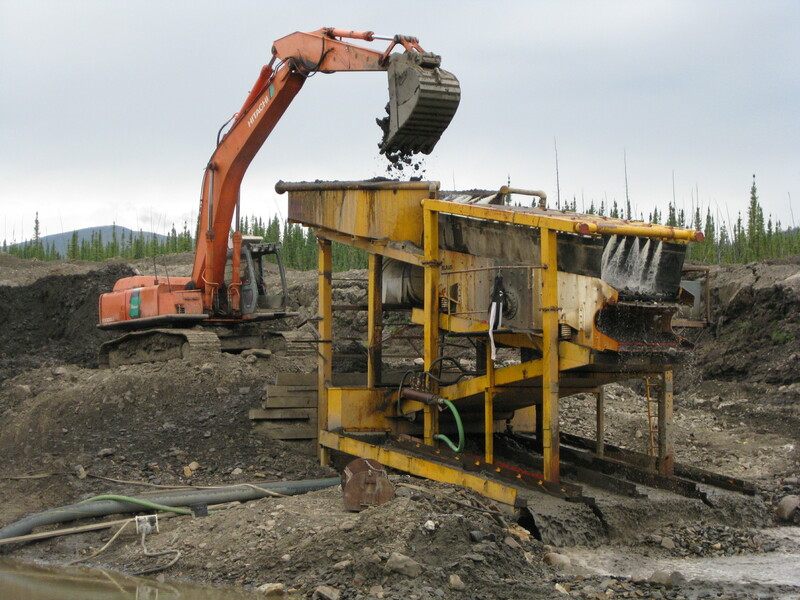 It is estimated that each of the dredges were producing as much as 800 ounces of gold per day! 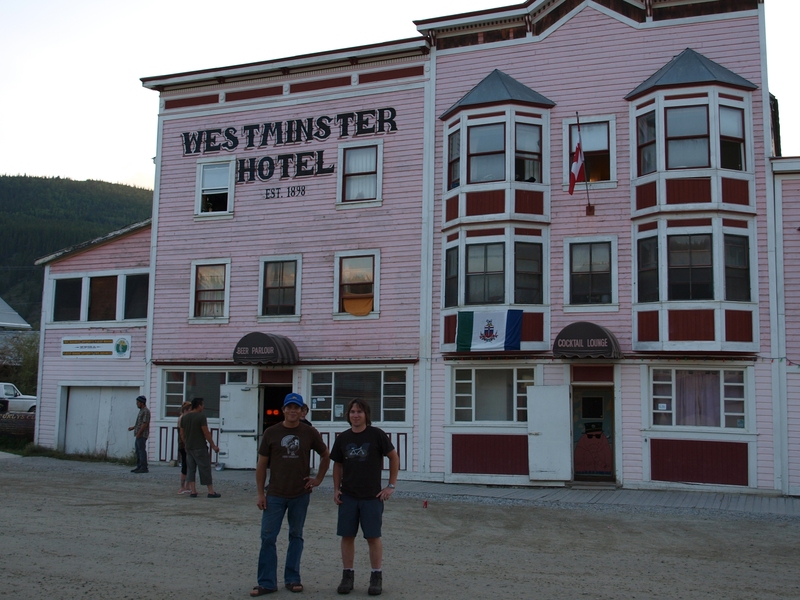 Dawson City is a cool town. 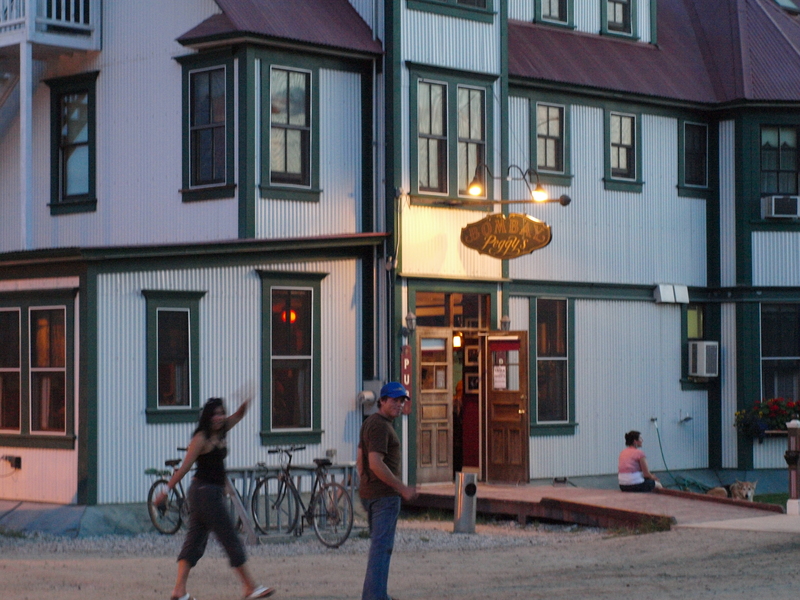 The residents have maintained the look and feel of Dawson’s heyday during the Klondike gold rush. The streets are dirt with wood plank sidewalks. 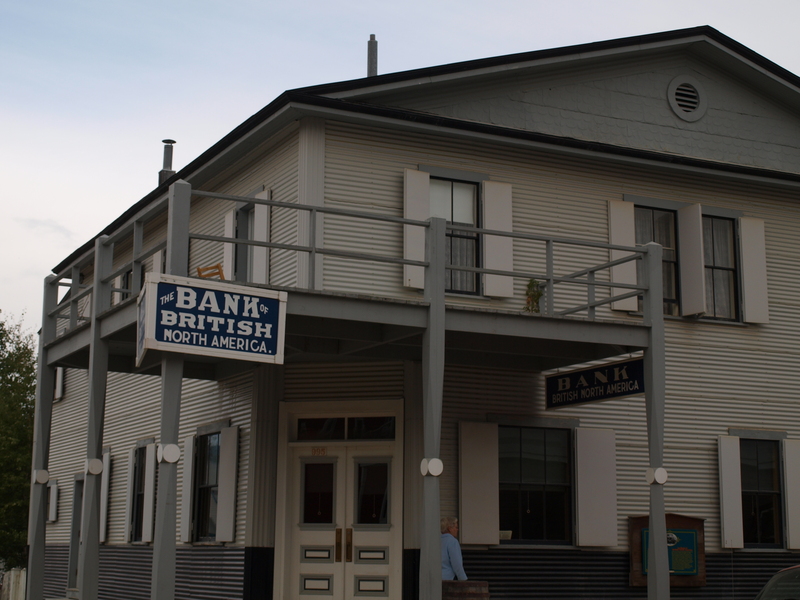 Most of the buildings are original in the downtown area and many commercial buildings have the false front that was the norm during the gold rush era. There is even a law that all signs have to be hand painted. 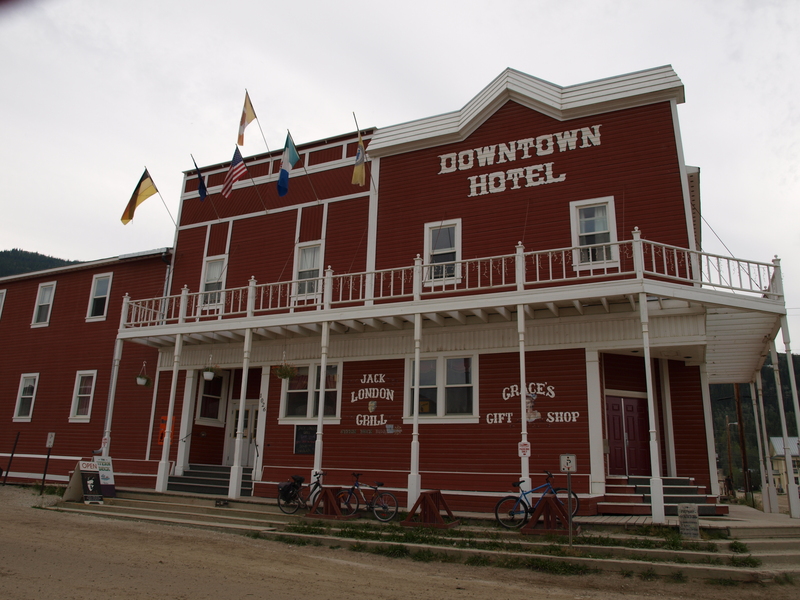 There are no corporate stores or businesses in Dawson. Everything is locally owned and operated. Some of the original establishments from the 1890s are still in operation today. Diamond Tooth Gerties is one such establishment which offers games of chance and nightly can can dancers 7 days a week. Anouther is Bombay Peggy’s which operated as a brothel during the gold rush. It has turned into a classy bed and breakfast now. Dawson has several historic bars as well. One such bar is the Downtown Hotel. We stopped in there one night after visiting several other bars and took part in a local tradition. It is called the Sourtoe Cocktail. Only one of my crew was willing to take the shot with me. The Sourtoe Cocktail is a shot of Yukon Jack whiskey taken with an amputated human toe in the glass. 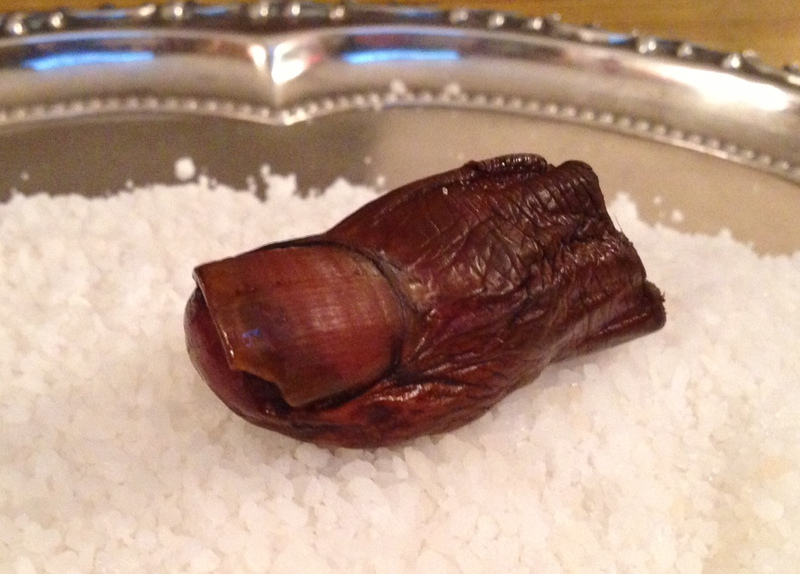 They keep the toe in a jar of salt above the bar. Apparently the tradition started with a bootlegger losing his toe due to frostbite. I was informed that this was their 6th toe which makes you wonder where they new ones came from. The Bonanza Creek Road is the main access to Indian Creek. Along this historic route there are plenty of relics of past mining adventures. Most notably the historic Dredge No. 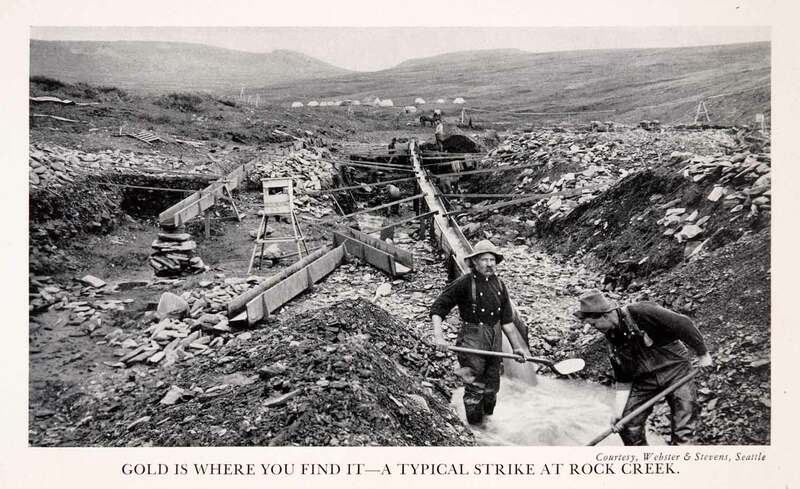 4 which mined Bonanza Creek until 1959. There are other dredges as well and plenty of old heavy equipment that was abandoned by miners of the past. There are abandoned bulldozers, excavators, trucks and other random big machines. There is such a surplus of iron that many bridges use large dozer shovels as retaining walls. 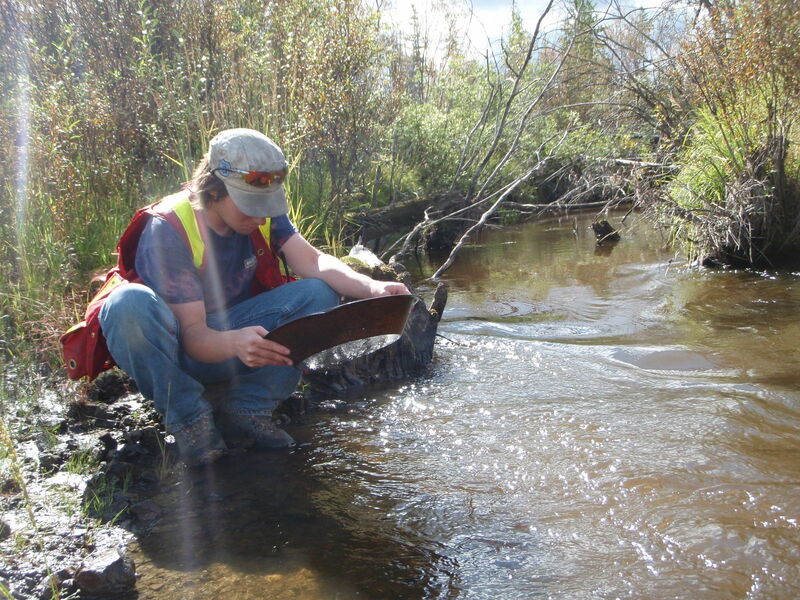 We were tasked with finding the source of the placer gold in the Indian River. We stayed at Big Al’s camp and were exploring mineral claims that overlapped his placer claims. His knowledge of gold bearing benches as well as historical research was very important in our search. Likewise our findings were beneficial to Al in exploring new placer areas. Most of our time was spent exploring old miner’s trails on quads and by foot. I’d be lying if I said it wasn’t a great time. 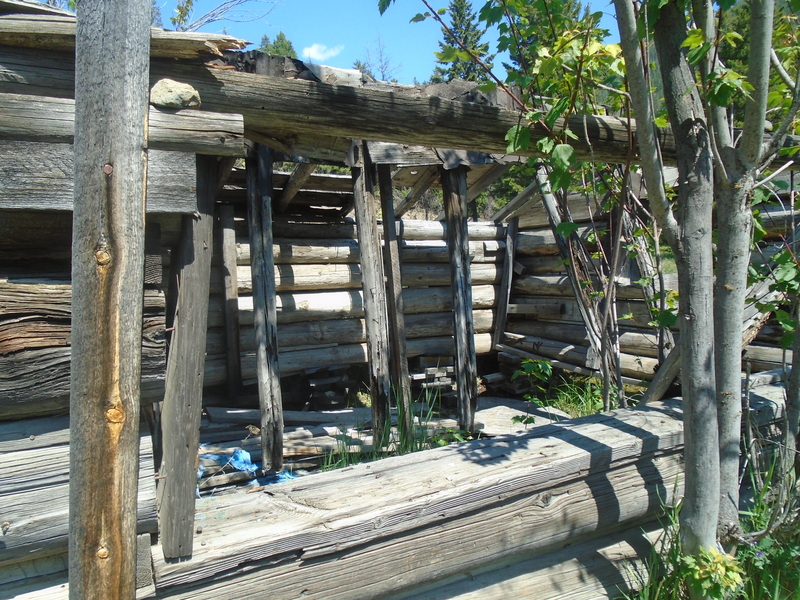 We came across several old mine shafts and evidence of placer mining was everywhere. My crew participated in some of Big Al’s cleanups too. It was exciting to see the amount of gold that he was pulling out. We participated in all the steps of his cleanup process from cleaning the sluice to the concentrator jig and so on. At each stage a fair amount of rum was consumed it seemed fitting when surrounded by hundreds of ounces of gold. Yup, that’s exactly what it looks like. 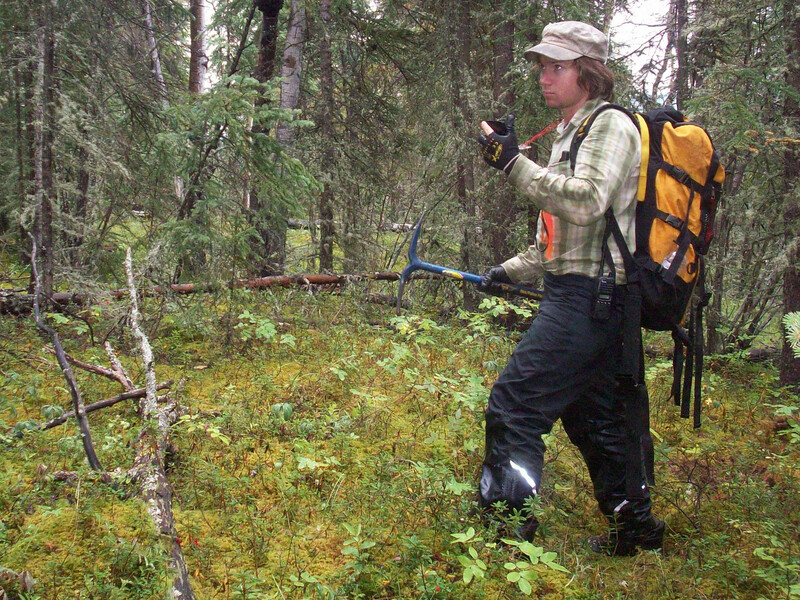 In our hard rock exploration we employed several techniques utilizing traditional prospecting as well as soil sampling and statistical pebble counts. 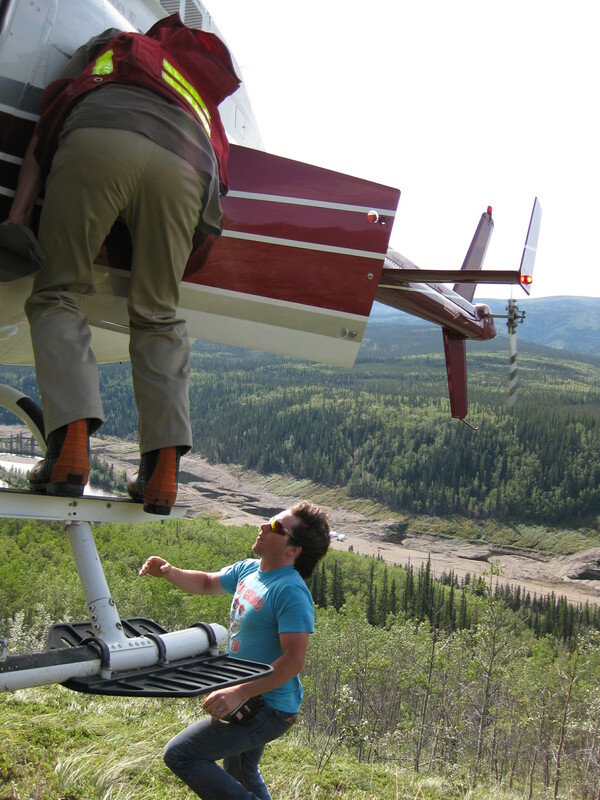 The soil sampling was conducted with helicopter support which made it a lot easier. We were bagging close to a hundred samples per day each which was more than we could carry in the bush. At the end of the day we’d chop out a helicopter landing area and radio the chopper. 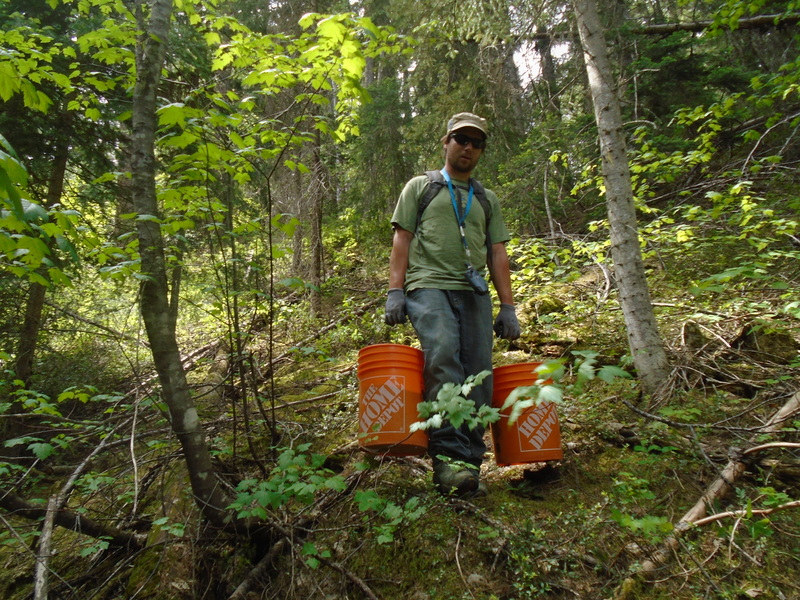 Then we’d pick up the samples that we cached during the day. Hard work but a lot of fun too. We spent a total of six weeks prospecting the area. We took a lot of samples to be sent in for assay from all over the claims. 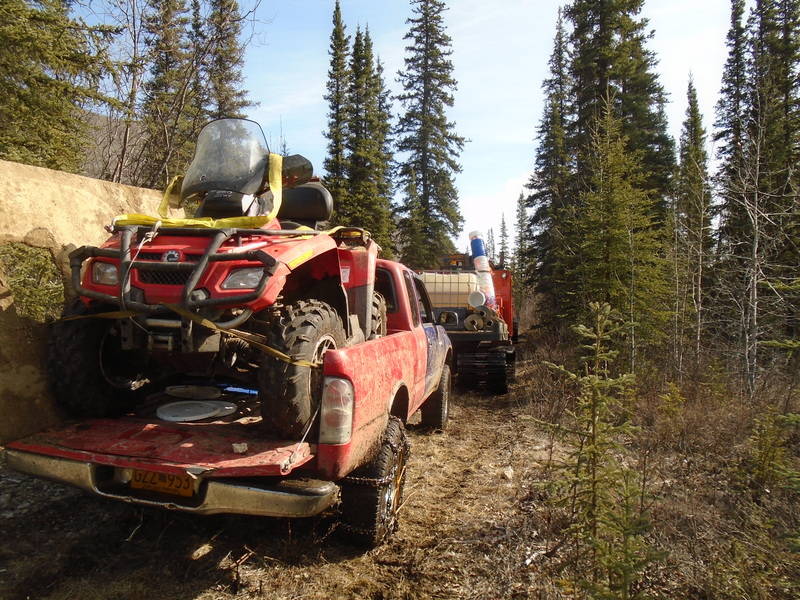 Prospecting in the Yukon is similar to BC, there is not a lot of exposed rock around. Unlike the barren lands of the North West Territory and Nunavut there is plenty of forest and vegetation covering the rock. 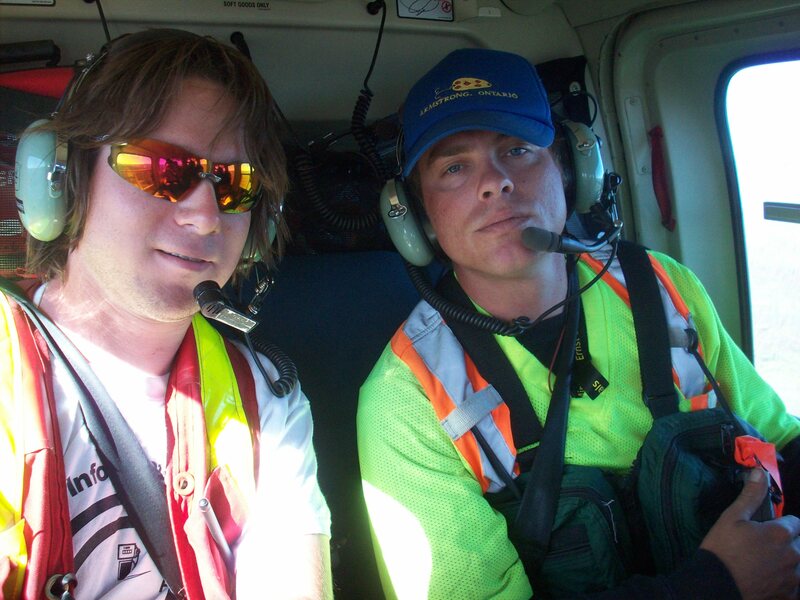 We spent a lot of time in the helicopter scoping out rock outcrops. There seemed to be a correlation between the garnets that were showing up in the placer operation and high grade gold. When the placer miners hit the paystreak they got a lot of garnets with it. We started prospecting up a creek called “Ruby Creek” assuming it was named for the abundance of garnets. The hunch turned out be be right. We chased the garnets up to some large outcrops near the top of the mountain. The samples contained a lot of garnet but not a lot of gold. From an old mineshaft that we found near a cabin we discovered that the miners hit a layer of pure quartz conglomerate. And it was loaded with gold. We then knew what to look for. 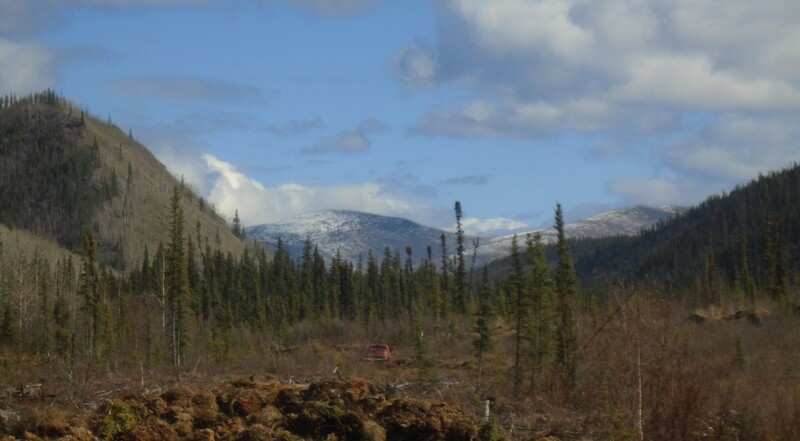 The search for the source of the Klondike gold continued for several weeks. 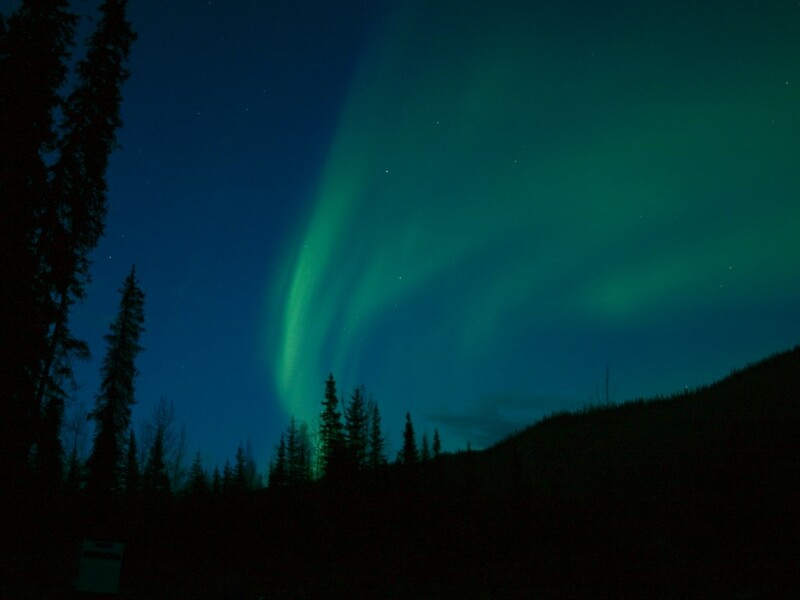 We encountered giant moose, grizzly bears, Northern Lights and some great people. On several occasions we thought we found the fabled mother lode but the samples returned disappointing assay results. Some of the more random samples showed the highest grades. They say gold is where you find it. We did not find the source of the klondike but we did manage to have a great time and got paid for it. 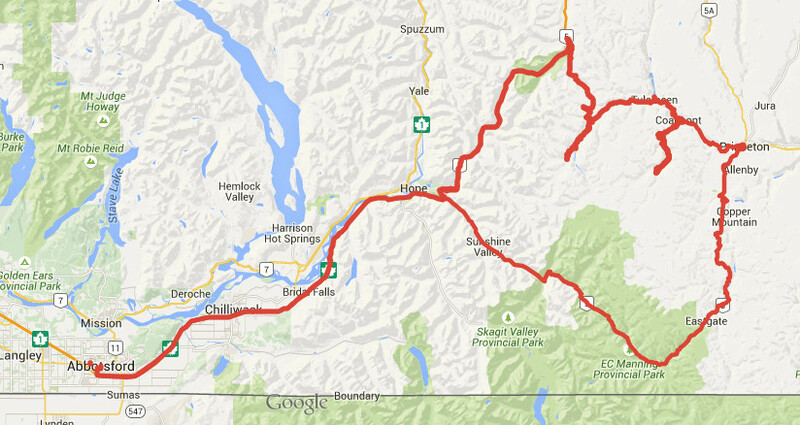 Prior to the gold rushes in BC this part of the country remained almost entirely unexplored. The Clovis people and their descendants the North American Indians were the first settlers of North America. The Clovis crossed the Beringia Land Bridge from Siberia to present day Alaska approximately 13,500 years ago. When Europeans began exploring the area, first by sea in the late 1700s and later by canoe, they encountered aboriginal groups covering much of the province. Many Indians had seen gold in creeks but had little use for it. They did not have the knowledge or motivation to mine gold until they came into contact with Europeans. After learning the value of gold to the British they began to mine it and trade for goods. The Spanish explorers on the other hand were completely obsessed with the yellow metal. Spanish explorers were motivated primarily by legends of “El Dorado” in their search of the Americas. Each Spanish explorer had the ultimate goal of returning to Spain with a ship full of gold. Most of their attention was focussed in South America where their superior weaponry, armour and small pox allowed them to quickly decimate tribal empires and steal their gold. There is evidence of Spanish gold exploration in BC as well. Most of the Spanish exploration took place on Vancouver Island and other coastal areas such as Haida Gwaii. 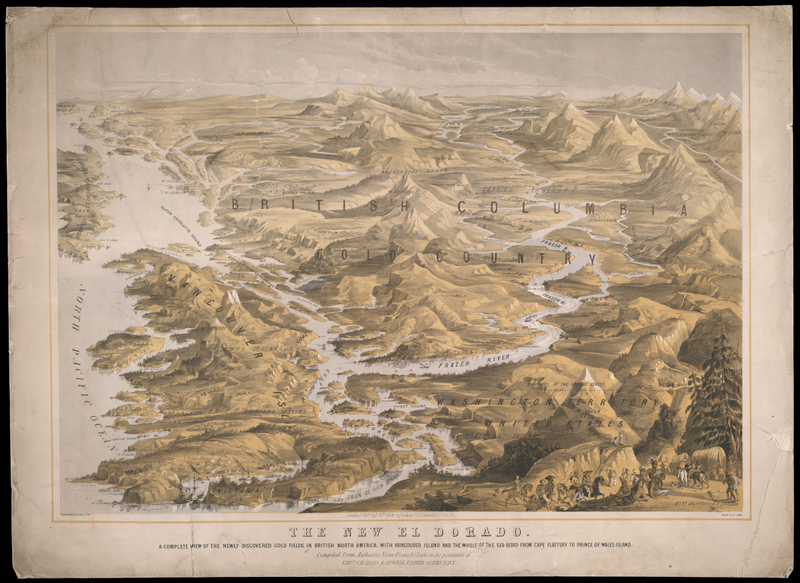 One Spanish expedition travelled inland as far as the Okanagan and Similkameen regions. Fur trading is what led to the first European settlement of British Colombia but the impact remained relatively small. 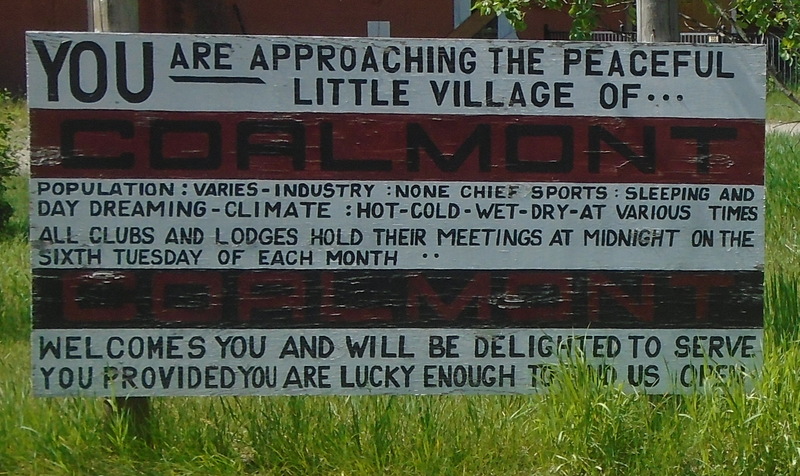 The first settlements were established by early explorers such as Simon Fraser, Alexander Mackenzie, and David Thompson. Early forts were established along the river routes that these explorers used as well as along the coast. The area became a recognized fur trading district called New Caledonia and it held that name until it became a British Colony in 1858. Fort St. James was founded in 1806 and was the first major inland fur trading post in BC and still bears that name. Other notable early forts are Ft. George (now Prince George), Ft. Kamloops, Ft. Langley and Ft. Victoria (1844). During the fur trade the European population slowly grew to a few hundred people but little effort was put into exploring new ground outside of the established trade routes. The Haida Gwaii gold rush was the first recorded gold rush in BC but was very short lived due to hostilities with the local natives. The rush began in 1851 when a Haida man traded a 27 ounce nugget for 1500 blankets in Fort Victoria. A Hudson’s Bay Company ship was sent up there soon after and discovered a very high grade lode deposit. 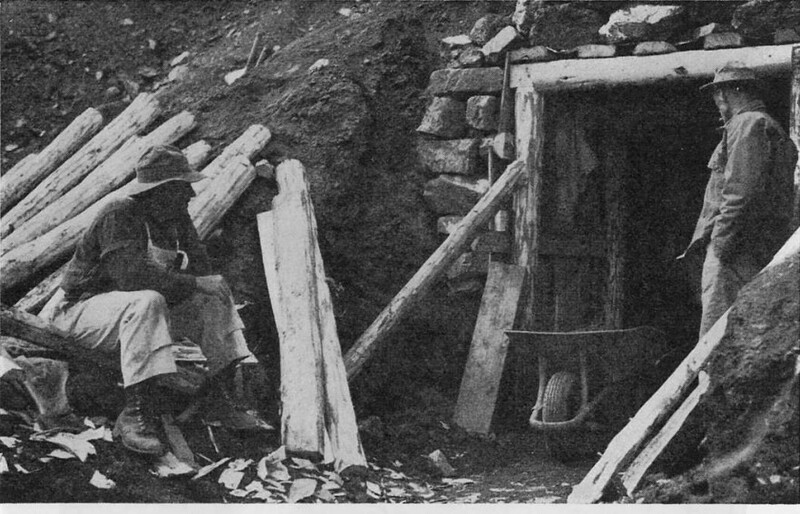 The HBC crew began mining the lode deposit but the Haida Indians soon turned against them and prevented further mining. In 1852 a ship with 35 adventurers from San Francisco set out for the islands. They arrived at “Gold Harbour” in the Tasu Sound but did not have much luck finding gold. They did however manage to trade with the Haida Indians for gold. Placer gold was discovered in Nicoamen River which is a tributary to the Thompson River. 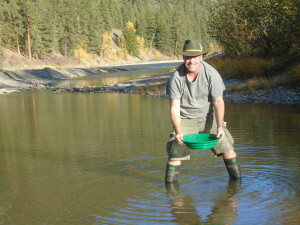 The Nicoamen enters the Thompson about 12 kilometers up stream from the confluence with the Fraser River at Lytton. A local Indian discovered gold there by chance and soon the majority of the tribe was mining the area. 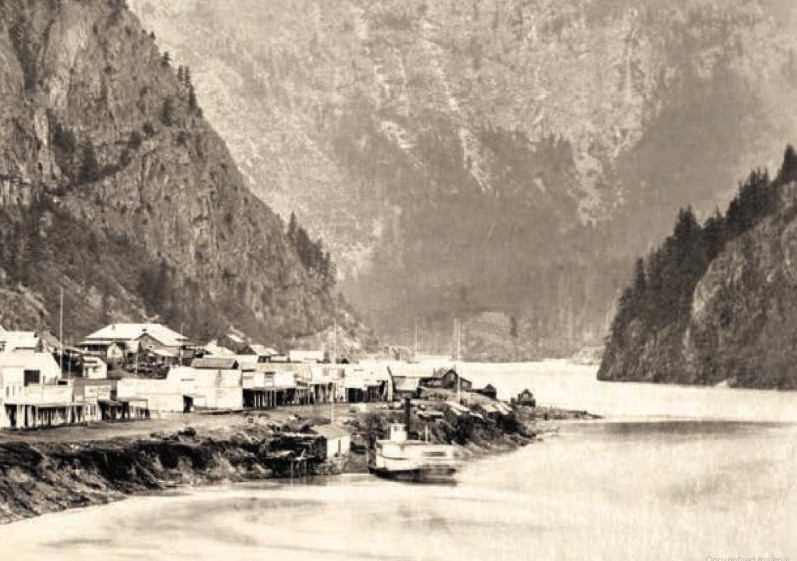 This discovery is credited with igniting the Fraser River gold rush. The Fraser River gold rush involved one of the largest populations of migrant prospectors in history. It is estimated that around 30,000 people rushed to the lower Fraser River in 1858. The rush began after an 800 ounce gold sample was sent from Fort Victoria to San Francisco for assay. Soon after a shipload of 800 American prospectors from California arrived in Victoria to hunt for gold on the Fraser River. The influx of American prospectors overwhelmed the small government that managed the territory. HBC Governor James Douglas requested immediate help from Britain to control this massive foreign population . The British Government responded by formally claiming BC as sovereign British Colony in 1858. The new government quickly enacted mining laws to prevent the mayhem that took place in the California goldfields. 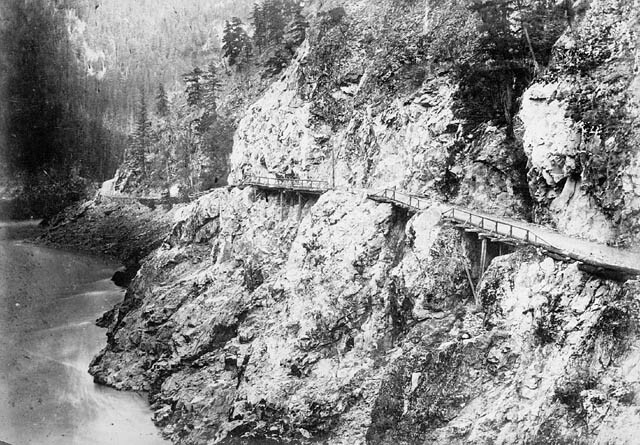 Along with the declaration came British military support and the Royal Engineers who went on to build several major road systems including the Cariboo Wagon road and Dewdney Trail. The early work centred around the community of Hope where steamboats allowed for easy access. The majority of the gold rushers were participants in the California gold rush that fizzled out a few years earlier. As a result the population of Yale was largely american and the town was modelled after San Francisco. 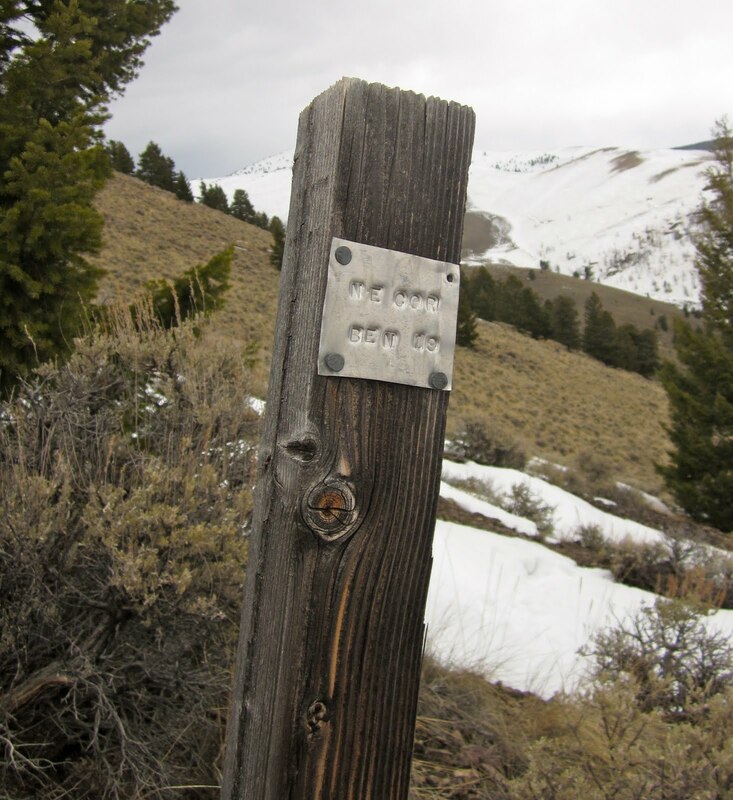 Numerous bars were prospected and mined between Hope and Lytton. 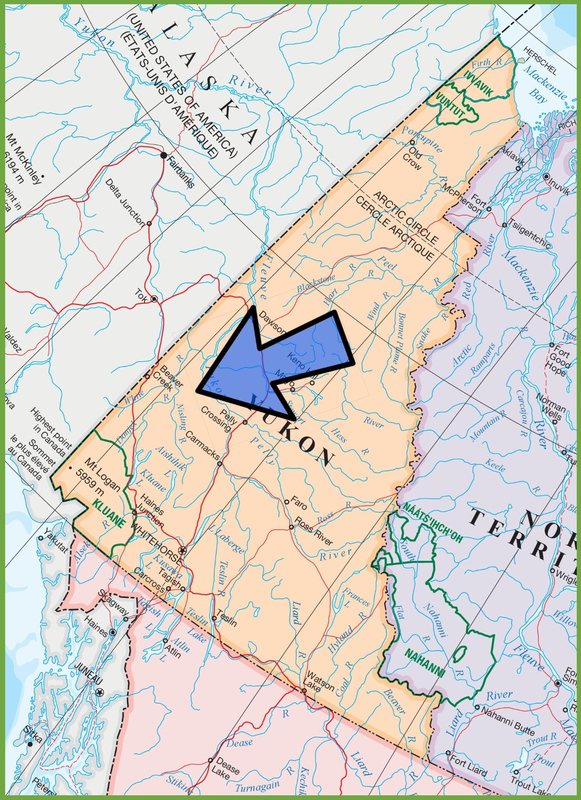 Some communities along the Fraser are still named after the bars that were mined such as “Boston Bar”. Like most gold rushes the men who arrived first snapped up the good claims and the the majority of the adventurers ended up working for them. The British Royal engineers developed a route from Port Douglas at the head of Harrison Lake to Lillooet to accommodate the influx of miners. Many new communities popped up and some are still settled today. The Fraser rush brought people from all over the world but the bulk of the miners came from California. At the peak of the rush there were over 10,000 miners operating on the section of river form Hope to Lillooet. The bars depleted rapidly and by 1860 most of the miners continued on the other gold rushes in BC. Gold was discovered in Rock Creek in 1858 soon after miners rushed in from the United States and the rest of the world. 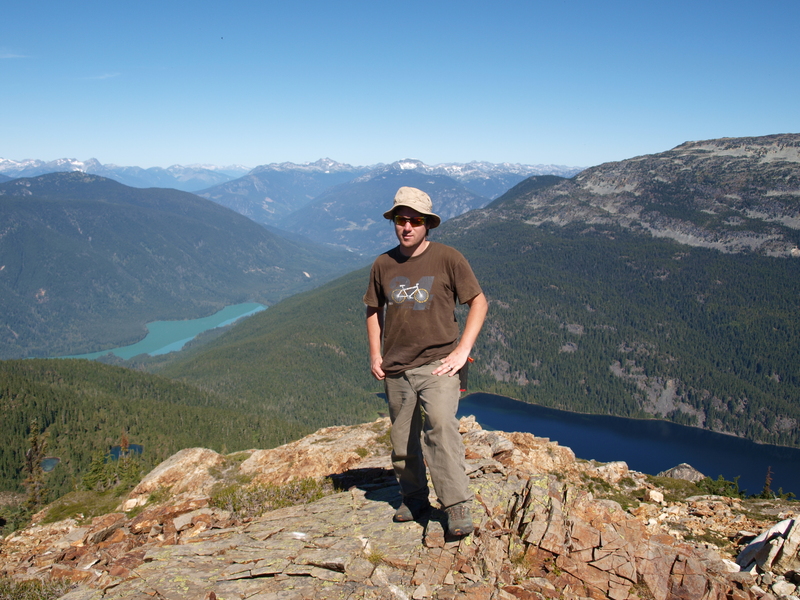 The Rock Creek rush was also instrumental in the development of British Columbia. The discovery was made by two American soldiers who were chased North of the boarder by a band of Indians. 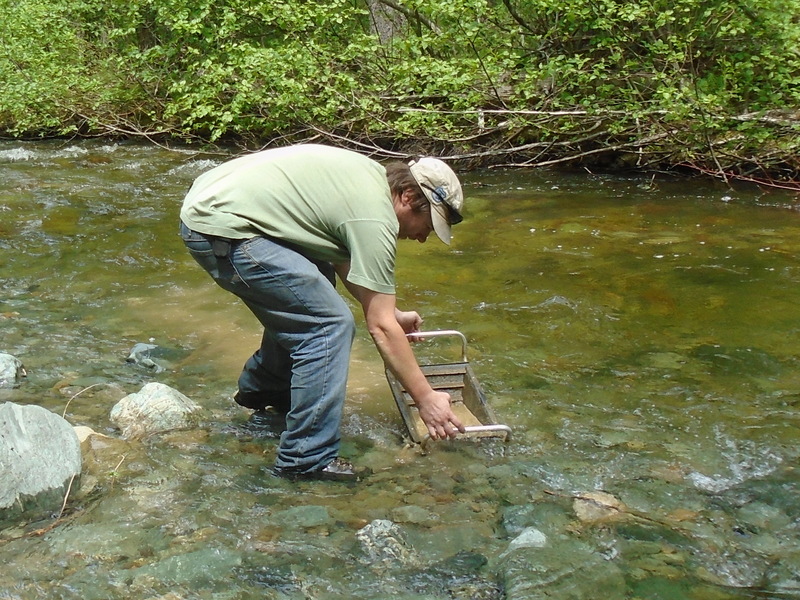 Just 5km from the border where an unnammed creek entered the Kettle River they found gold. At the time of the discovery the colony of British Columbia was only a year old. American miners tried to claim the area as part of the United States due to the high grades and the fact that it was discovered by Americans. The Rock Creek claim issues prompted the construction of the Dewdney Trail as a means to separate the new colony from the United States. The Dewdney Trail snaked its way from New Westminster all the way to Wild Horse in the Kootenay region staying just North of the Canada-US border. Soon after the discovery an estimated 5,000 prospectors migrated to the newly established town of Rock Creek. In the beginning there were two saloons, a butcher’s shop, a hotel and five stores. Within the first year a revolt broke out due to tensions between Chinese and American miners and refusal to pay for mining licences. The incident became known as the Rock Creek War. The governor of British Columbia Sir James Douglas travelled there from Victoria to straighten out the miners. He threatened to send in 500 British soldiers if they couldn’t behave themselves. Sir Douglas was successful and soon the miners paid their claim fees and mined the creeks in peace. There were some amazing claims on Rock Creek. Adam Beame’s claim on Soldier’s Bar in 1859 allegedly netted $1,000 in six weeks. That gold would be worth $70,500 today! Other bars such as Denver Bar and White’s Bar produced similar results. Gold was discovered on the Horsefly River in 1859 by prospectors who participated in the Fraser River rush. They were guided by a local Indian and shown a spot on the Horsefly River with abundant gold and nuggets the size of wheat kernels. 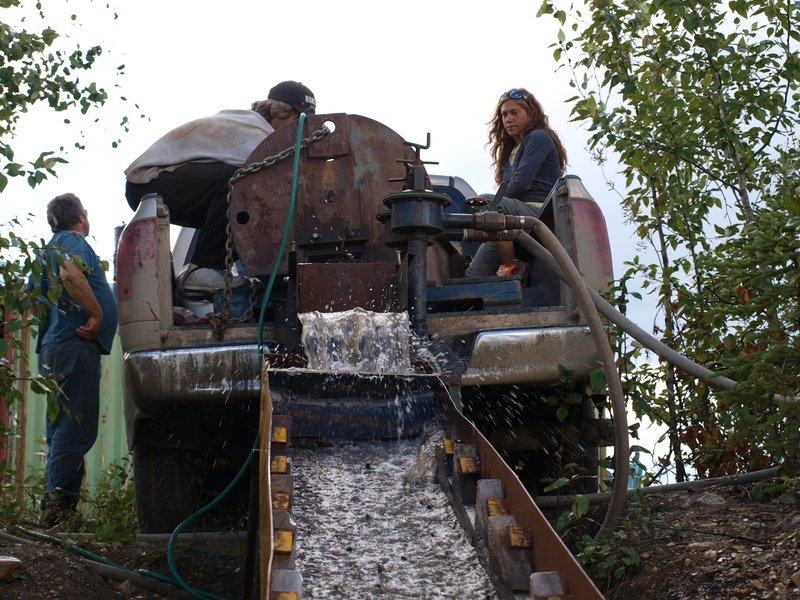 The rush was on as more miners from the Fraser River rush migrated North to the Cariboo. Soon a town was erected near the strike that exists today. 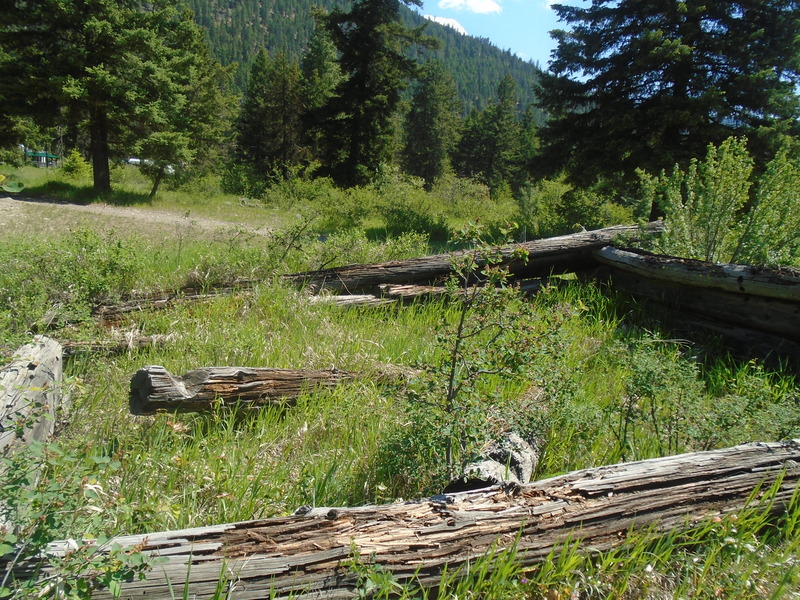 In 1860 gold was discovered on Keithly and Antler creeks to the North of Horsefly. Other notable creeks of the region are Lightning, Lowhee, and Williams Creeks, the Quesnel River and Parsnip River. Towns popped up all over the place with the most exciting being Barkerville. That town was named after a British prospector named Billy Barker and had a popluaton of 10,000 at its peak. His claim on Willams Creek was one of the greatest gold producers in history yielding an estimated 37,500 ounces of gold. 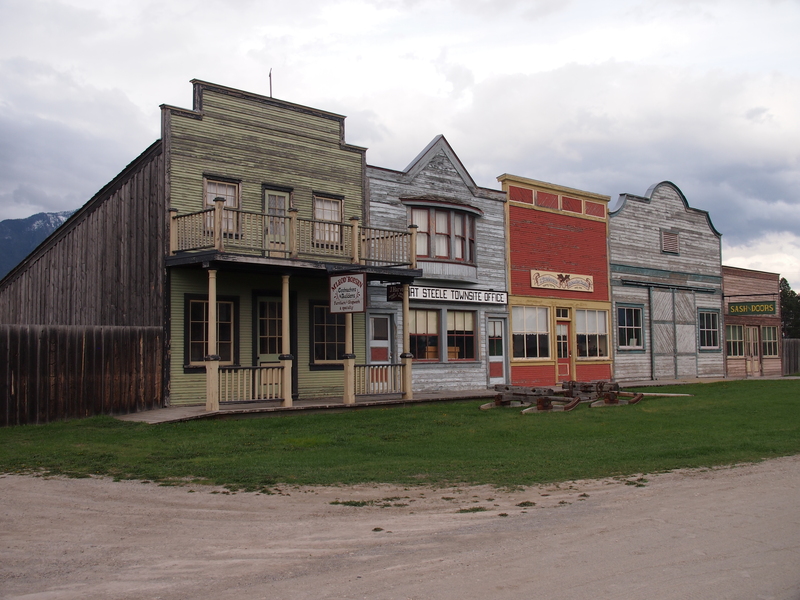 Barkerville was restored in 1997 as a tourist historic town that is a popular attraction in the area. 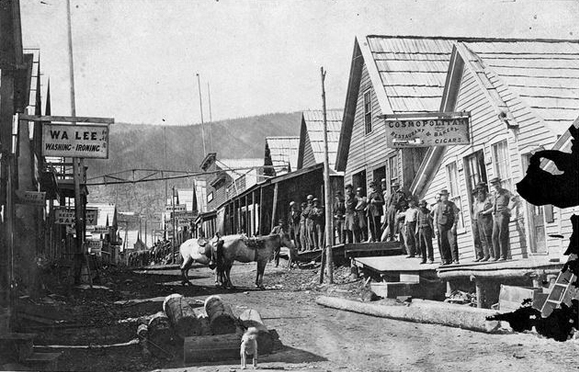 The Cariboo gold rush saw 100,000 people flood into the area during 1862-70 from all over the world. 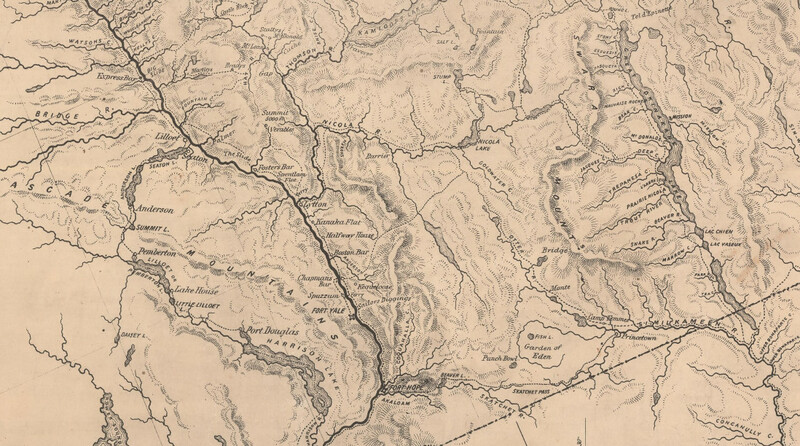 By 1864 the Cariboo Wagon Road was completed from New Westminster all the way to Barkerville. This allowed for easy travel of people and supplies, wich substantially brought down the costs. It also allowed for stage coaches to securely move gold from the mines. The stagecoaches operated on this road from 1863 to 1917 carrying people, mail, express packages and of course gold. 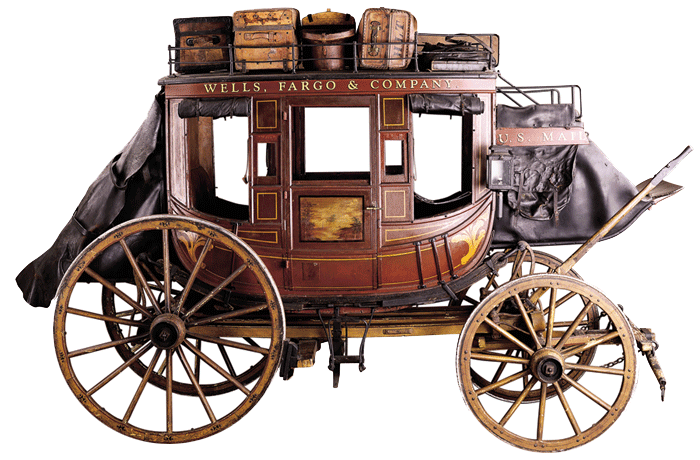 The stagecoaches saw surprisingly few hold ups, even though they carried literally tons of gold. There are only five hold ups on record, two of which were successful. By 1870 the gold rush had largely fizzled out. The good claims were now owned by mining companies who could gather the money needed to undertake underground drift mining. Those who didn’t stick around to work in underground mines spread around other parts of BC’s North and some sparked gold rushes in new areas. Others settled in and started up cattle ranches or logging companies. 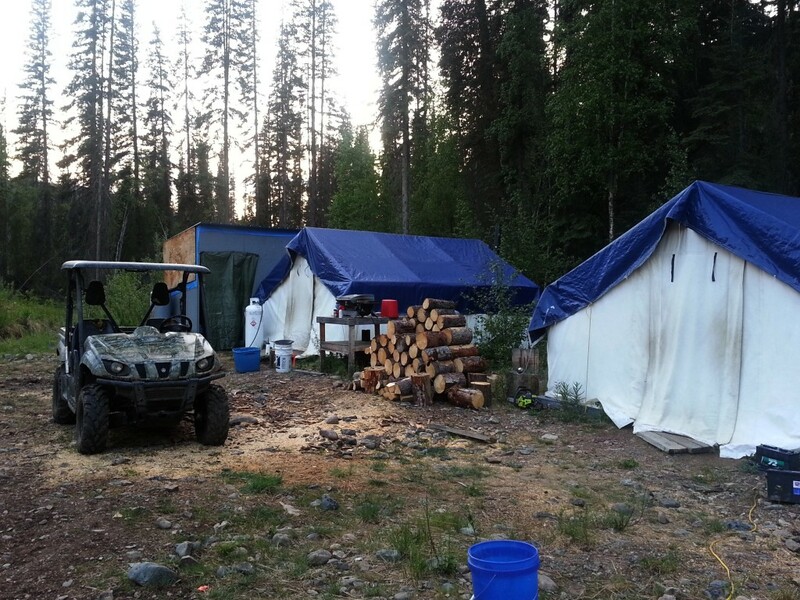 Gold mining in the Cariboo is still active today, as a matter of fact I have a couple claims near Keithly Creek. 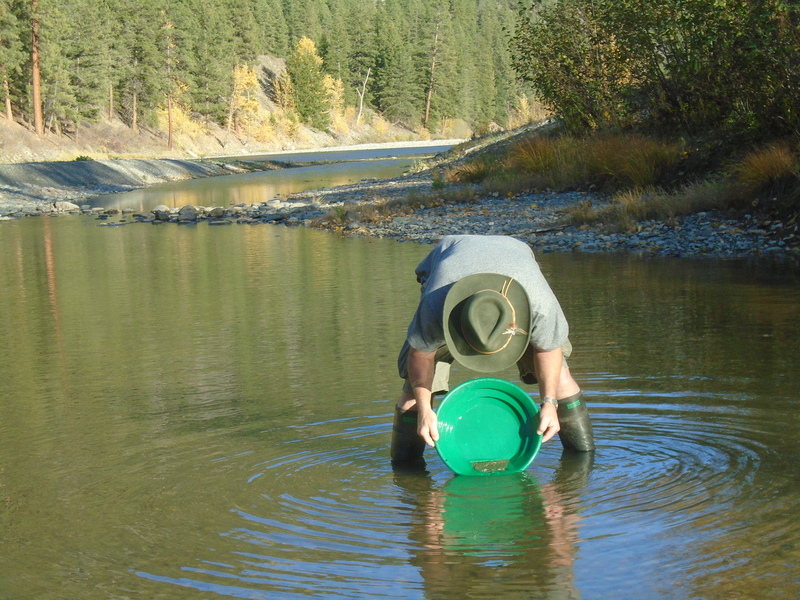 Gold was discovered on the Wild Horse River in the Kootenay region in 1863 once again by American prospectors. The Wild Horse held great gold reserves and still does today. Early in the rush huge nuggets were found with the biggest tipping the scale at 36 ounces. The first town that was built was called Fisherville. Apparently after one resident found a nugget under his house the size of his fist the whole town burned their houses down to dig underneath. A town was erected named Galbraith’s Ferry, named after John Galbraith who operated a ferry across Kootenay lake. Later the town was re-named Fort Steele after the legendary Sam Steele. A second gold rush broke out in the same area in 1885. Later hard rock silver rushes spread around the region. The Wild Horse River is estimated to have produced over $7,000,000 in the initial gold rush which would be worth about $490,000,000 today. There is a very well preserved historic town at Fort Steel that is a popular tourist spot with many actors playing the roles of old time blacksmiths, prospectors, sheriffs and so on. It is located North of Cranbrook at the intersection between Highway 93 and 95. The initial gold rush ended after about 6 years but soon the great silver rush would flood the region. Places like Nelson, Kaslo, Slocan grew out of the silver rushes that blanketed the Kootenay region. The discovery which I have to communicate is the finding of gold on the banks of one of the Forks of the Sooke River, about 12 miles from the sea in a straight line, and in a locality never hitherto reached by white men, in all probability never even by natives. I forward anquarter eighth of an ounce (or thereabouts) of the coarse scale gold, washed out of twelve pans of dirt, in many places 20 feet above the river, and with no tools but a shovel and a gold pan. The lowest prospect obtained was 3 cents to the pan, the highest $1 to the pan, and work like that with a rocker would yield what pay you can better calculate than I can, and the development of which, with what results to the Colony you may imagine. 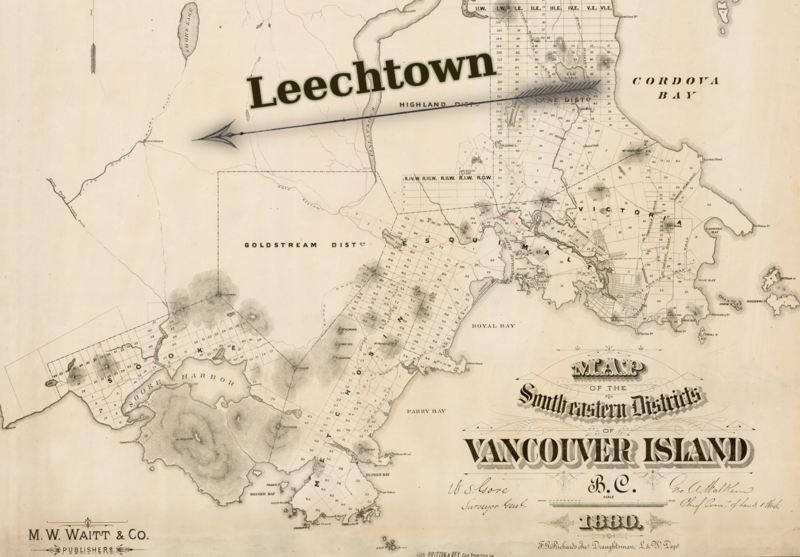 A town called Leechtown was built near the discovery. By November that year there were an estimated 6 general stores, 3 hotels and over 1,200 miners at work in the area. By 1866 an estimated 200,000 ounces of gold had been produced in the area and the gold rush had passed its peak. It was over in a flash as the Leech and Sooke river placer deposits, although high grade, were limited in size. In the span of one decade gold rushes turned the vast unexplored fur trading district of New Caledonia into a sovereign British Colony. 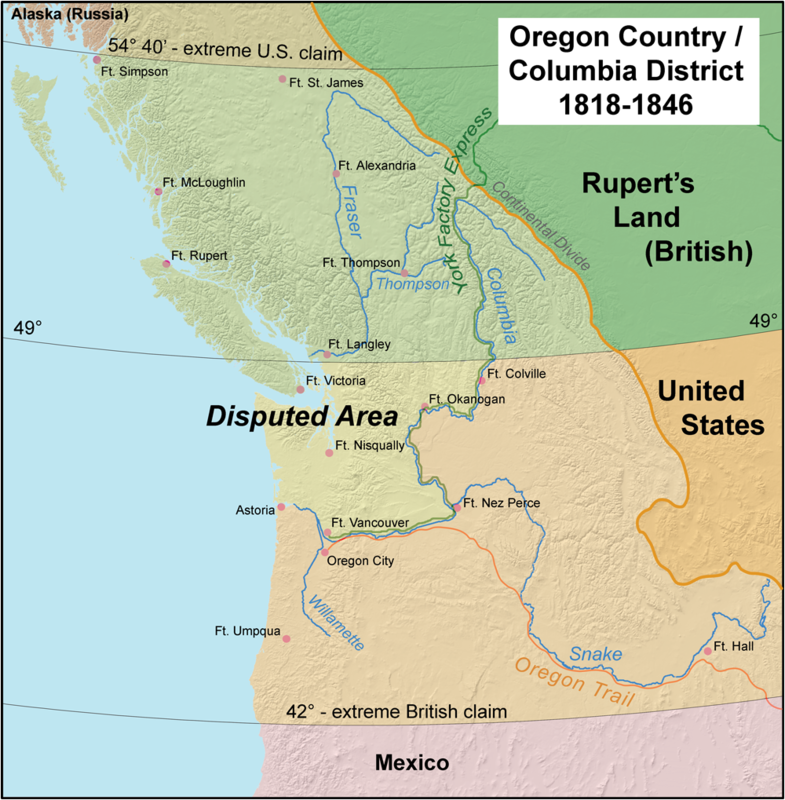 By the end of the 1860’s the new region had gone from a population of under one thousand people to a colony with several major wagon roads and towns covering much of the Southern half of BC. The gold rushes continued and led to more development in British Columbia. Stay tuned for part 2. 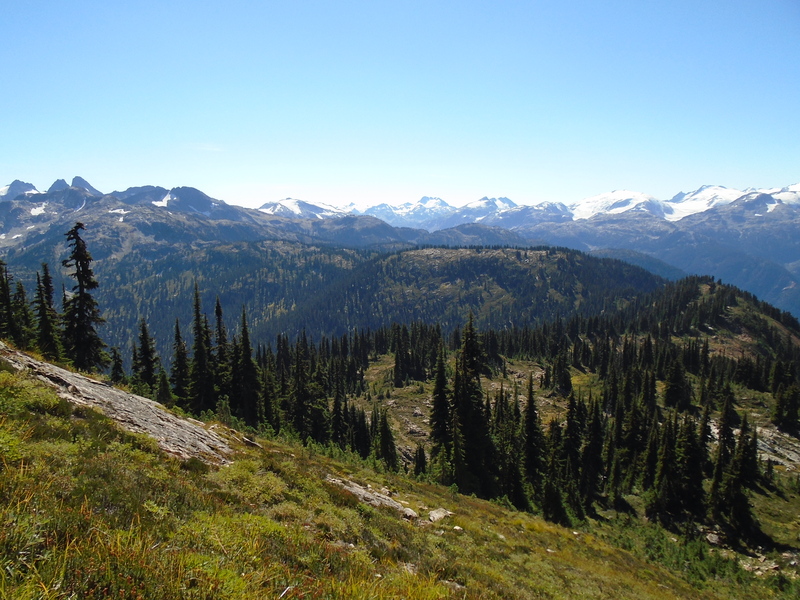 This claim is located in the Cariboo-Chilcotin region of BC. The location is fairly remote and there are no paved roads for quite a distance in any direction. When you are out there you are definitely alone. It has sort of an eerie feeling all day and night, it feels deserted. There is a ghost town near the claim and some signs of a more active human presence from a distant time. 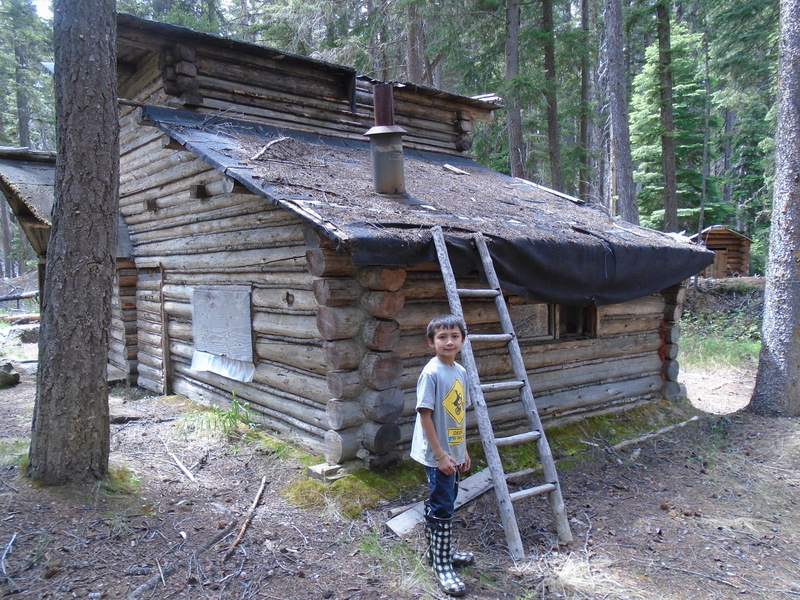 Check out this post for pics on of the ghost town, Southern Cariboo Prospecting Trip. The hike down to the river is pretty tough. There is about a 1000 foot elevation change from the access road to the river. We went down there the first day to sample the beach. We came across a couple of bedrock outcrops which prevented us from travelling any further. The bedrock had some gold stored in the cracks and we were able to get some of it out. Near the river we saw some decent colour in our test pans. We marked the locations on my GPS and made our way back up to the camp. We had some great burgers cooked on the campfire and a couple of beers. It is getting pretty cold up there this time of year. Once the sun goes down the temperature quickly falls below freezing. We had a nice big fire and enjoyed the stars for the evening. It was pretty tough to get out of our tents in the morning. The moment when you unzip your sleeping bag and start putting on cold clothing is the worst. I’d like to stay in my nice warm bag for a couple more hours but we came up here for a reason. We found an old claim post with tags from 1989/90 right in the center of the claim. 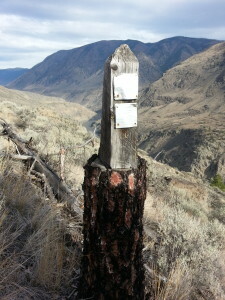 The post was actually carved out of a tree trunk and is the most creative claim post I have ever seen. As far as industrial markers go this is a work of art. I hope to find out more about this G. Johnson and what he had discovered on the claim. As we were making our way down to the river for day two of prospecting we came across a creek that seemed to appear out of nowhere. My partner noticed some gravel near the surface and we thought we might as well pan it. In that pan we saw a small coarse chunk of gold. This was pretty exciting since it was located several hundred feet above the river. We took several more pans in that spot and found a little bit of gold in each one. Now we have to find out where that mysterious little creek is getting the gold from. My partner had a Bazooka Gold Trap and we tried it out on this little creek. The gold trap seemed to work pretty well. It’s an interesting design that has a chamber at the back and a water scoop underneath that forces water into the trap. That was our last trip of the season to this area. The weather forecast says snow is coming this week and it will probably stick until the spring. 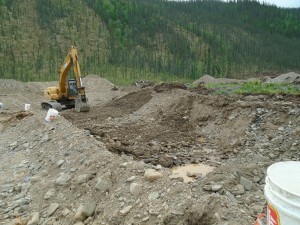 Placer mining is an exciting activity. It brings us out into the wilderness often to the road less traveled. There is a certain charm associated with the hunt for gold. 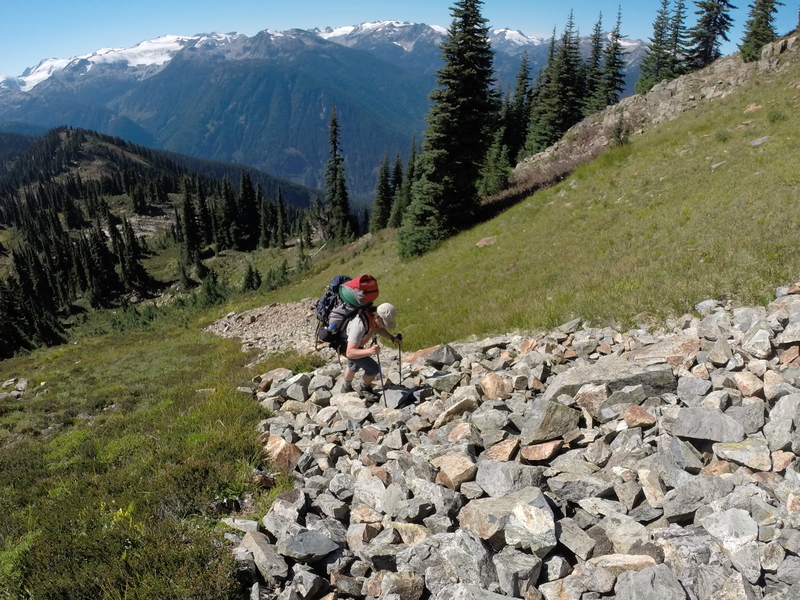 In some ways it feels like an exclusive club where the only entry requirements are the knowledge, skills and the will to take on the challenge of finding precious metal on the earth’s surface. For those starting out there is a lot to learn and all too often a novice miner’s decisions are influenced by greed or the infamous gold fever. 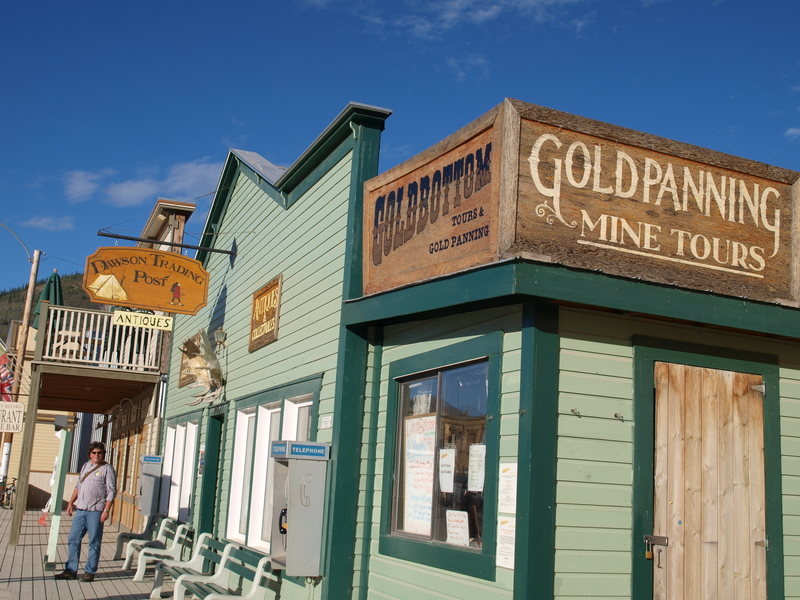 Here’s a list of some of the most common mistakes made by new gold miners. 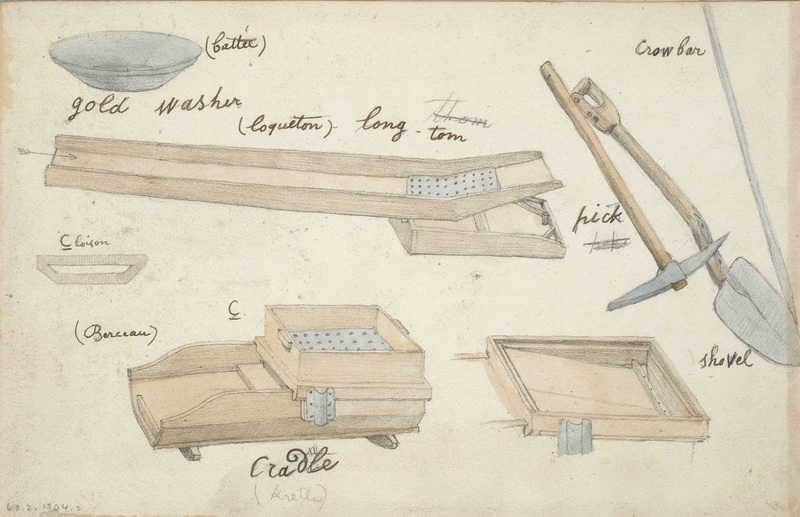 Placer miners are total gear nuts, myself included. To run even a small operation you need a fair amount of gear. 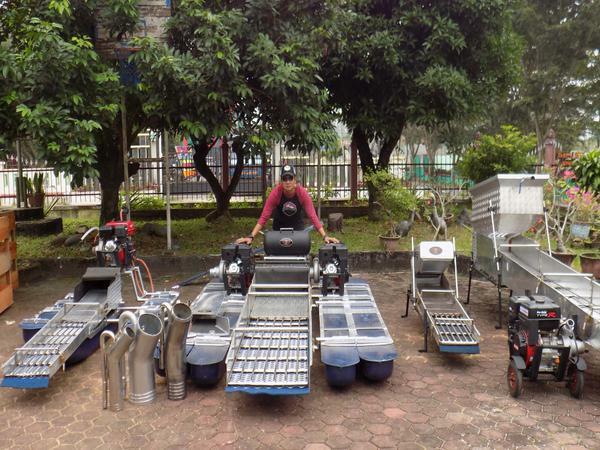 Pans, sluices, digging tools, camping equipment, 4×4 truck, etc. And there is plenty of gear on the market to spend your money on. However more equipment will not necessarily make you more money. Often its quite the opposite. In our fast paced consumer focused economy it is tempting to look for a quick fix. There is no substitute for hard work though. You need to put in the time and effort to find that gold. I have met several people who have purchased a brand new floating dredge with nowhere to use it. Fortunately their equipment quickly finds its way onto craigslist at a discounted price. 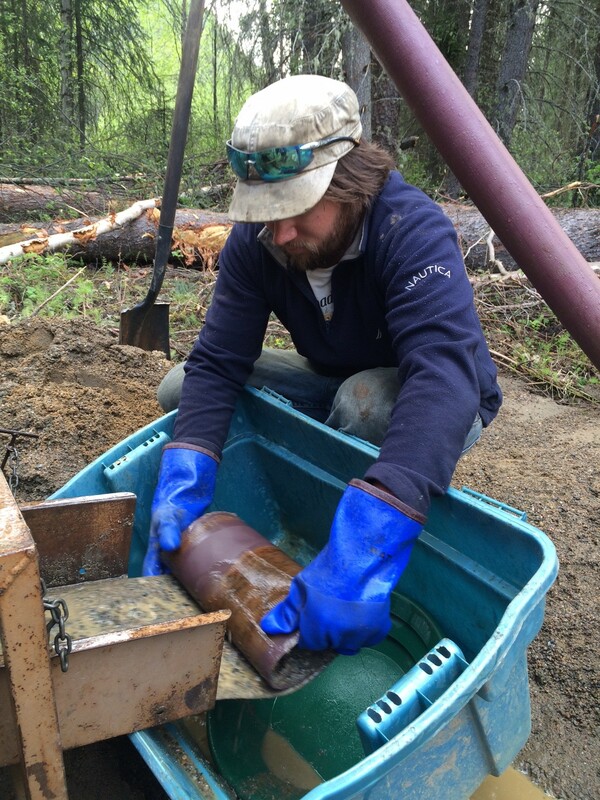 Prospecting starts with a gold pan, other tools that help are classifiers, snuffer bottles, and an accurate scale. Once you have proven gold in an area you can look at moving on to something that can move more material. The next progression would be a highbanker or a small diameter dredge (if they’re legal in your area). If you have found enough gold and can’t move material fast enough the next steps are moving to a larger wash plant and possibly heavy equipment. At each step along the way you need to assess the quantity of gold on your claim and the costs of getting it out. Its pretty exciting to have the rights to your first claim. You start dreaming of all the riches that are now yours for the taking. Its tempting to snap up the first claim that is available. Especially in areas with online staking, its a lot like buying concert tickets. Unlike concert tickets though gold claims are usually available for a reason. Perhaps the claim has poor access, little to no gold, or has already been mined to death. Do some research before you pull the trigger. Read up on the history of the area to make sure it hasn’t been thoroughly mined already. Make sure it has good access roads or trails. Find info on previous production in the area and if possible sample the claim before you buy it. 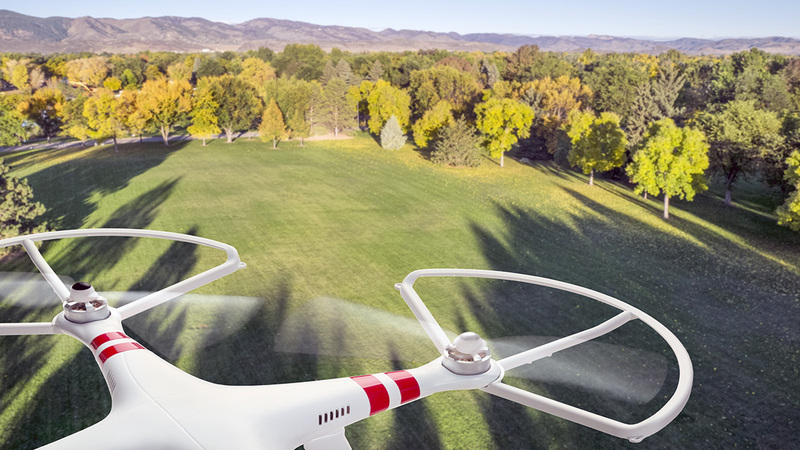 Check some maps to make sure the claim is not on a park, reserve or private land. Effective sampling is absolutely essential to run a profitable placer mining operation. You wouldn’t buy a car without taking it for a test drive. It is tempting to show up at a claim and start running a highbanker on the first gravel that you see. Even some larger operations forgo proper sampling in the rush to get mining and lose a lot of money because of it. 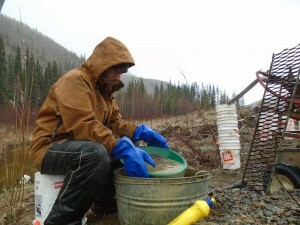 Sampling is not glamorous and you won’t get a lot of nuggets to show your friends but you need to know how much an area will pay before you spend time and money to produce it.Once you have thoroughly sampled an area and have calculated the pay per yard you will know how much you can spend to produce the gold. For example if an area pays $100 to the cubic yard and your cost is $40/yd to produce it you will certainly make a profit. Your proven reserve is sort of like a bank account. You don’t want to spend more money on equipment than your reserves will justify. 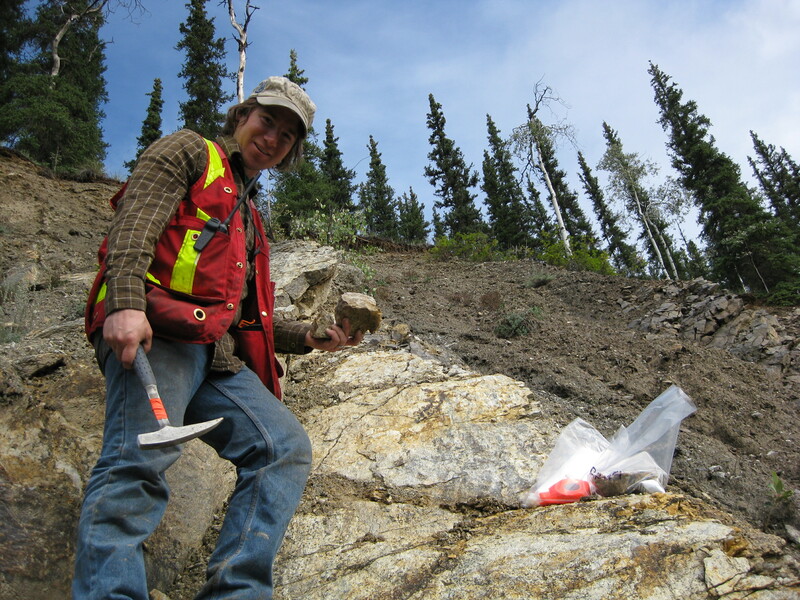 Almost every novice prospector will sample surface gravels and expect to see flakes of gold. 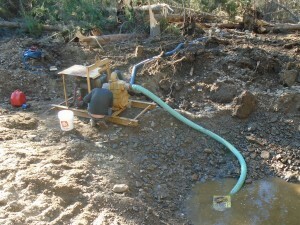 Placer prospecting and mining hinges on the fact that gold is very dense. Being heavy, gold will settle deep as it can in a gravel bed. When digging a test hole you basically want to dig as deep as you can. You want to reach compacted gravel before you start sampling. In most cases your best gold will be on the bedrock. In some areas there are clay layers or river armour layers that will trap the gold. It will always travel down until something prevents it from sinking any further. There are areas where flood gold can be found near the surface. It is important to know the history of your area. Even if there is surface flood gold though the real paystreak will always be deeper down. 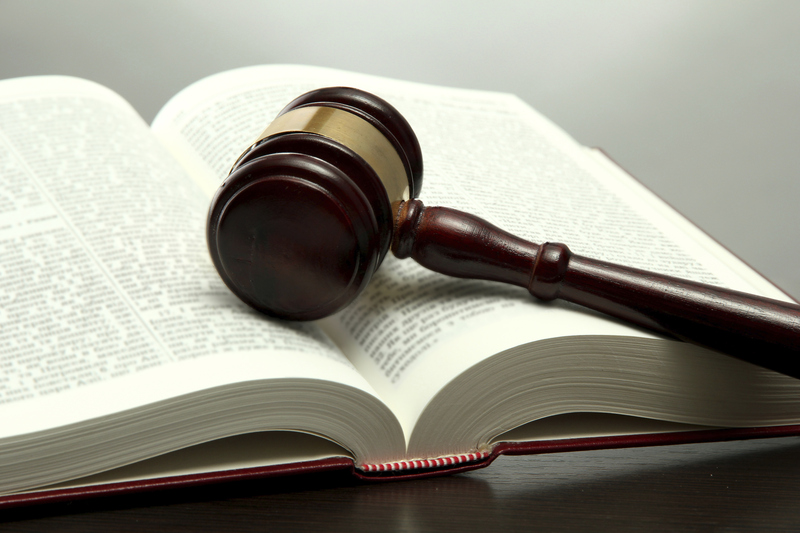 Just like other laws it is your responsibility to know the mining regulations for your area. I have heard too many stories of guys panning or running river sluices in areas that they didn’t even know were claimed. That is called claim jumping and is illegal. In the gold rush days it was perfectly legal and acceptable to shoot a claim jumper. Today claim jumpers can face a criminal record and imprisonment. The rules are not the same everywhere. A suction dredge might be perfectly acceptable in one area and completely outlawed in another. 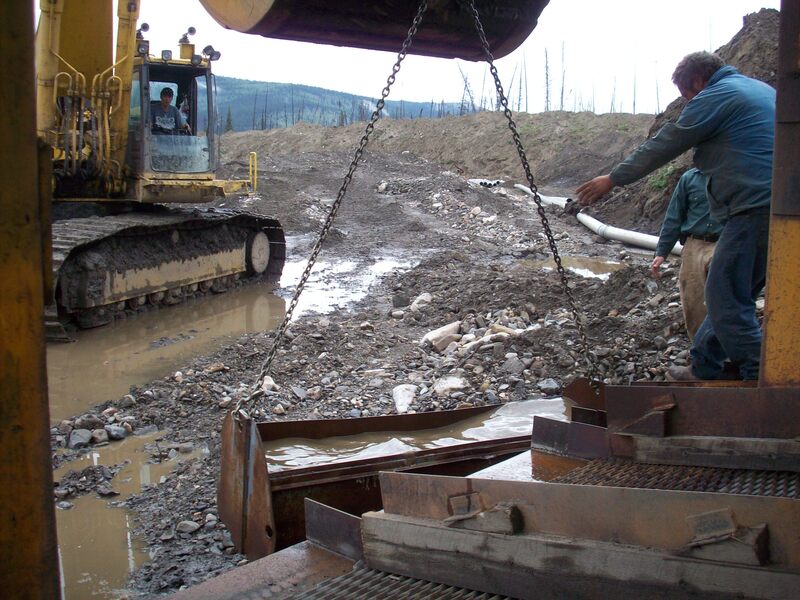 Dredges and highbankers area also regulated by water intake hose diameter and type of creek that you are working on. Other regulations to look out for are environmental rules for drawing water and working in riparian zones. Laws regarding exploration on private land, provincial parks or first nations land must also be obeyed. You have certain rights by holding a claim but that does not guarantee your right to dig in every situation. These days with the recent flood of gold mining TV shows it seems so easy. They give the impression that all you have to do is show up with an excavator and a wash plant and you’ll start pulling out nuggets. Often these shows have some arbitrary budget that the miner needs to reach by the end of the season. Just seeing numbers like $500,000 per season will get anyone excited. You may be thinking if they can get that I can at least get $1000 on a random claim. Spending an hour per night watching guys pour jars full of gold flakes on shows like Yukon Gold or Gold Rush Alaska will fuel unrealistic expectations. 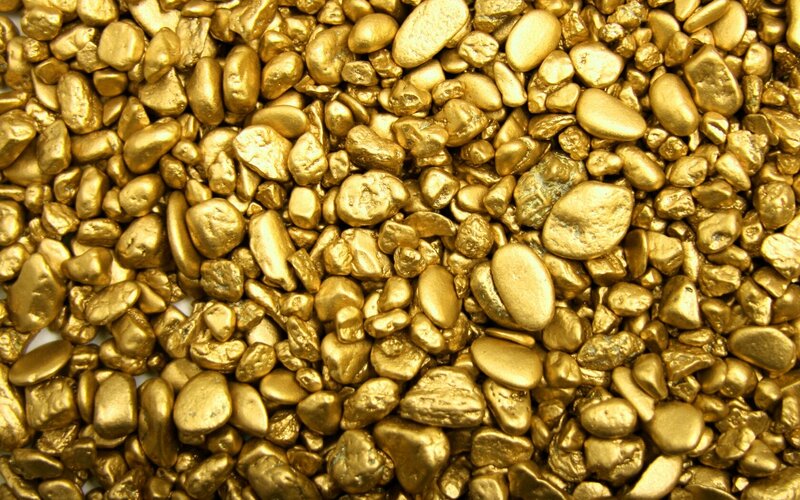 The fact is gold is valuable because it is incredibly rare. The value is largely due to the sweat equity of prospectors and miners who have spent lifetimes searching for the yellow metal. It will be a long road to get your first jar full of gold or even a vial for that matter. Prospecting for gold has an incredibly poor success rate. You will put in hard work, digging, hiking and panning for long hours and won’t see more than a color. Some days you won’t even see that. Gold is defiantly out there but don’t expect to see any in your first pan. 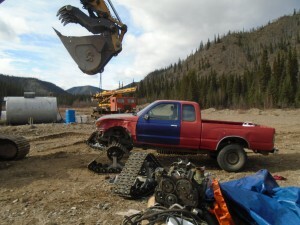 Most placer mining and prospecting equipment requires skill and knowledge to operate effectively. That is part of the appeal to prospecting, its a skill just like any other and takes time to develop. There are a lot of people out there who are not using their gold pans properly and washing gold right out of the pan. Likewise with highbankers, its a common mistake to mine all day with the wrong angle on your sluice. There is a lot of info out there on proper techniques don’t just buy equipment and try to figure it out on your own. The best thing to do is go out with someone who is experienced with the equipment that you want to use. You can watch Youtube videos all day but nothing beats hands on experience. Most placer miners will welcome an extra hand to help work the claim, in the process you will learn everything you need to know. Placer mining and exploration breeds innovation like no other activity. Virtually every prospector that you talk to has their own idea of what the best tool, product or technique is. If you ask three different miners what the best sluice is you’ll get three different answers. 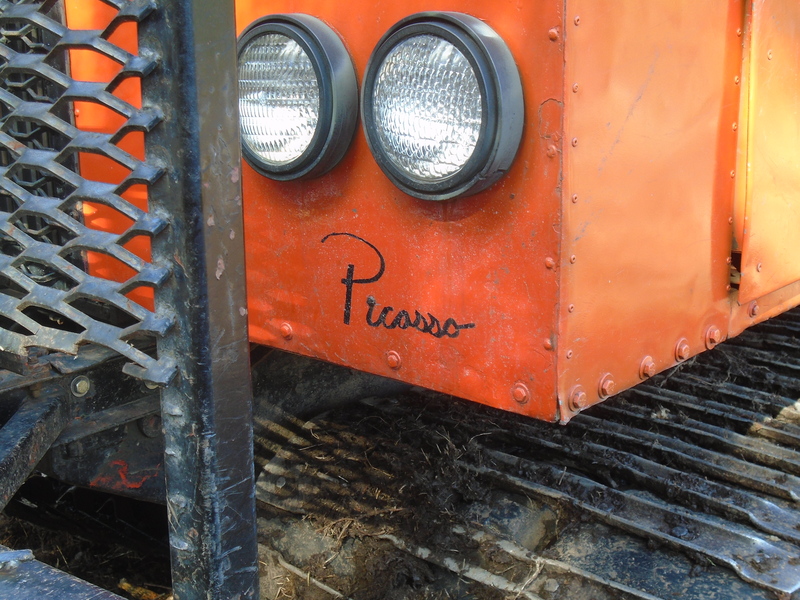 Much of the innovation comes from the trial and error learning process of placer mining. What works at one claim might not work at the next. You just have to experiment until everything works the way you want it to. The history of placer mining has a long list of innovations and miners benefited with increased yields at each step along the way. The gold pan was one of the first inventions, then followed the rocker box, sluice, variations of the sluice such as the long tom, hydraulicking water jets, dragline dredges and so on. The miners in the Klondike gold rush learned to melt the permafrost using fires to reach the bedrock below. Now they use modern excavators and bulldozers but it had to start somewhere. Every inventor claims that their product is the best. It can be hard to distinguish the good from the not so good. In the case of the Pyramid Pro pan developed by Dennis Katz at Fossickers.com it is a game changer. I am not affiliated in any way with the manufacturer of this pan I just really appreciate the technology. Fossicker is an unusual word, according to their website it is the Australian word for gold prospector. There are other pyramid shaped pans on the market but this one has some very unique features. First off it has insane riffles! These riffles do two things. They break up clay or hardpack along with the violent action of the pyramid panning motion. And they prevent any dense material (ie.gold) from escaping. The violent action must be emphasized. 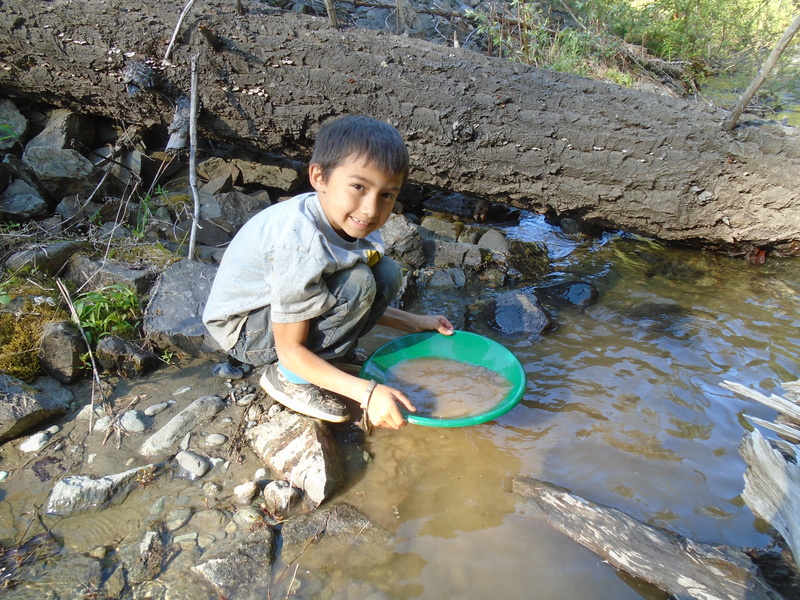 In conventional gold panning you want to avoid too much force and splashing because you will force your gold right out of your pan but that is the essence of the Pyramid Pro. The action is hard to describe and best seen in person. Check out the developer’s own instruction video below to see how it works. It is a little funny how the Fossicker keeps saying to “stratisfy” the material. What he really means is stratify, maybe its an Australian thing too. You hold the pan with those big handles almost like you’re holding a gas powered ice auger. It is a bit of an arm workout when you are going through a lot of material but the Pyramid Pro is designed to do exactly that. The experience is very unique and has little to do with conventional gold panning. The Fossicker calls the neck of the pan a pre-mix chamber. Once you get the technique down nothing will escape that chamber. The most important benefit for prospectors is that this pan is a lightweight unit that can concentrate a lot of material. It can essentially replace a small sluice or highbanker for a similar amount of material. Where it pays off the most is in places where you need to hike in to access a claim. You are not going to hike with a trash pump, sluice and hose for any considerable distance. With the Pyramid Pro there is no need to. I’m not saying its going to replace a highbanker or dredge when it comes to production. Technically it could but you would need forearms like Popeye. Where this pan really shines is in volumetric sampling. That means taking a sample of a set volume and using the gold values to estimate the pay over a larger area. For example you can take a sample of 50 liters of raw gravel. Concentrate it with the pyramid pan and then separate and dry your gold. You can then weigh that gold and extrapolate that number to a cubic meter or yard. As an example if you had 0.025 grams of gold recovered from your 50L sample that would equal 25g per cubic meter or almost an ounce. With careful sampling you can be confident that the area is worth the time and money to mine it. The pressure plug at the bottom makes taking samples super easy. Once you have concentrated your sample down, you just pull the plug and dump it into a container. If you were doing the same thing with a highbanker you would have to do a full clean up for each location. With this tool you can rapidly sample a large area in no time flat. The plug can be easily replaced if you damage or lose it. The plug is just a 1.5″ plumbing plug which is available at any hardware store. The plastic is surprisingly tough. 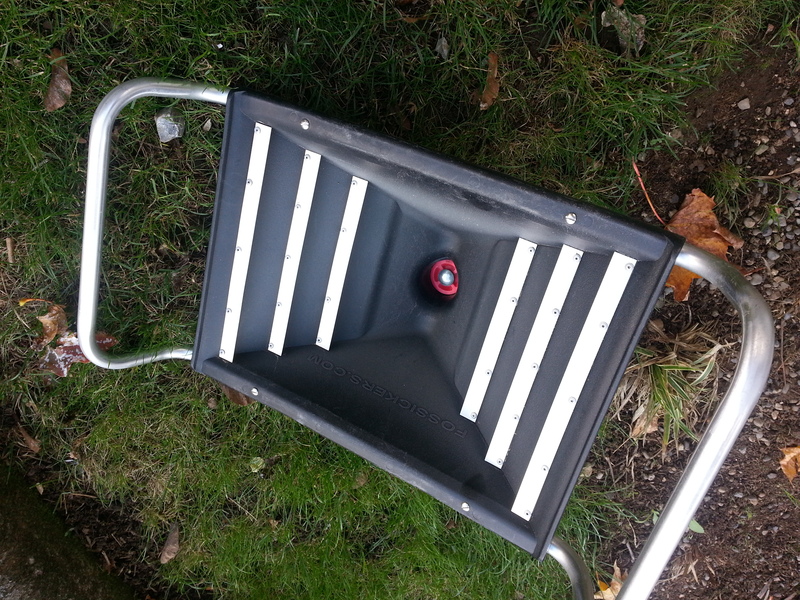 I had my pyramid pan on the back of my pack on a particularly perilous prospecting mission. I wiped out on a jagged rock outcrop and landed with my full weight on the pan. I thought it was going to be toast but was relieved to see that no damage at all had occurred. Likewise with my other plastic pans. I don’t know what kind of plastic they use but it is unbelievably durable. The Fossickers website claims that it has a lifetime guarantee just in case you did manage to break it. The Pyramid Pro pan is the center of my sampling technique. The fact that it is ultra-portable and can concentrate a lot of material makes it an indispensable tool for the modern prospector. They are not cheap though, I paid $120 for mine and its worth every penny. 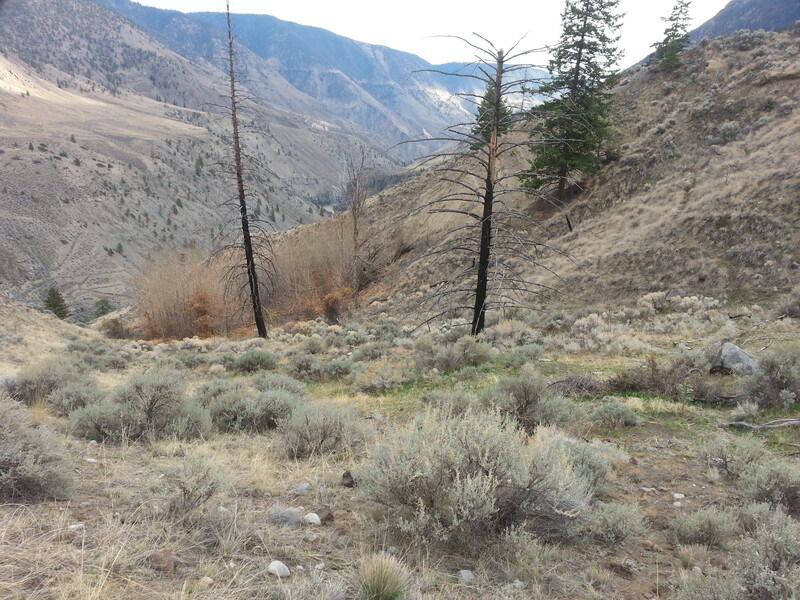 Earlier this week I traveled to the Similkameen to prospect a gold claim. I was joined by Bernie, who I met on the internet. The goal of the trip was to due some reconnaissance prospecting of this claim to determine where to focus our efforts in the future. 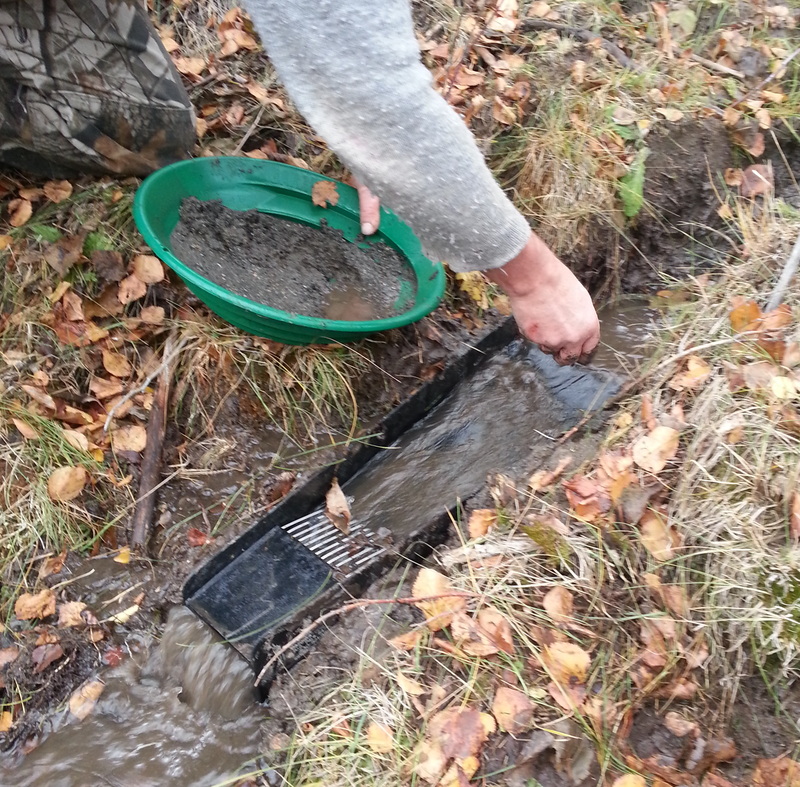 We were prospecting using hand tools and gold pans. In addition to gold panning we took several large samples using a pyramid pan to concentrate the material on site. This claim is located a short drive to the East of the town of Princeton. The weather in October is a bit of a gamble but we had great conditions for this two day trip. It was sunny both days and slightly below room temperature. 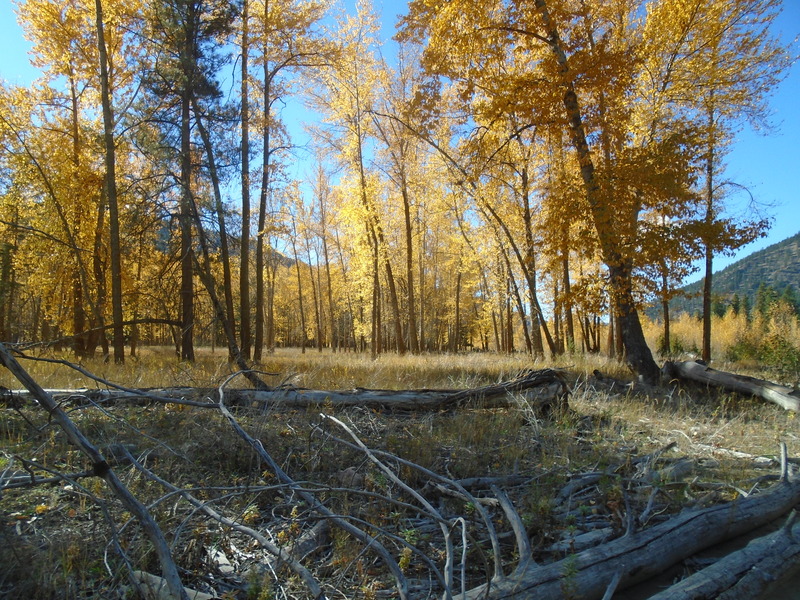 The scenery is spectacular this time of year with the bright colors of the fall leaves contrasting the evergreen trees and the surrounding mountains. 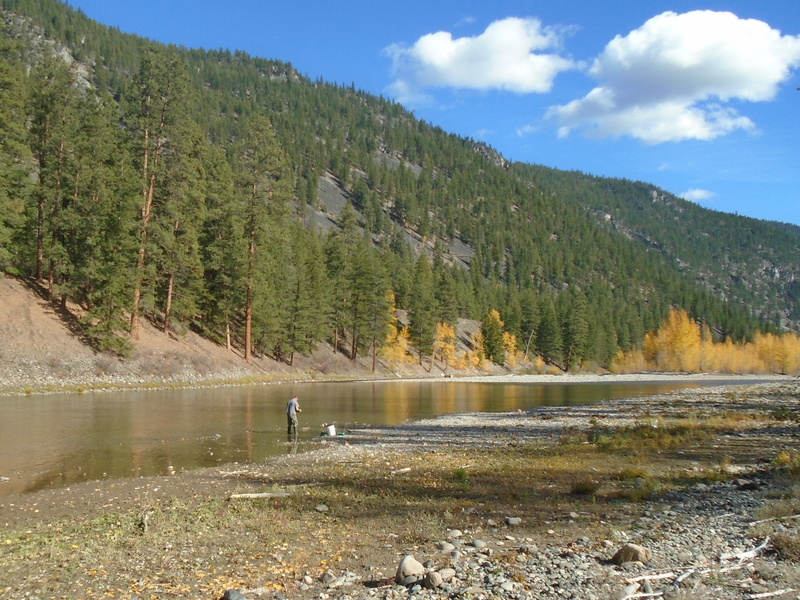 The Similkameen river has a long history of placer mining and exploration. 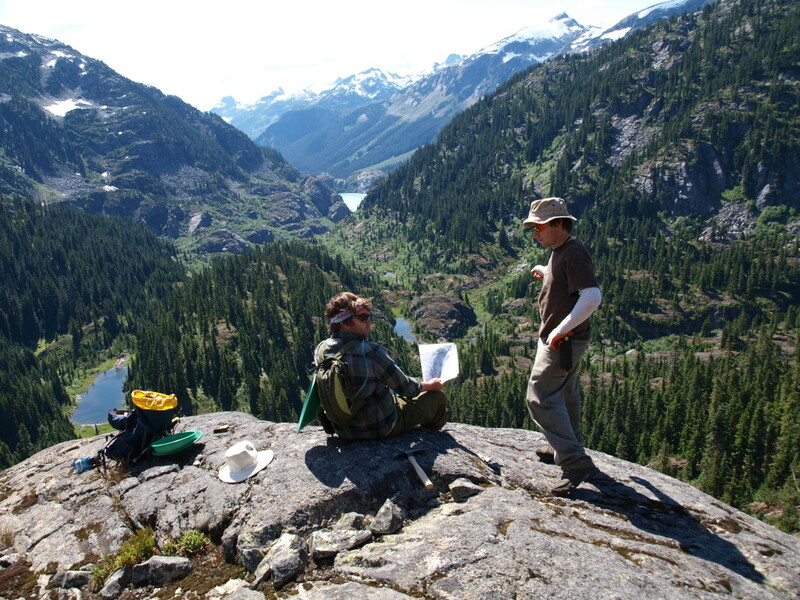 Prospectors began digging in the area soon after the Fraser River gold rush that began in 1858. 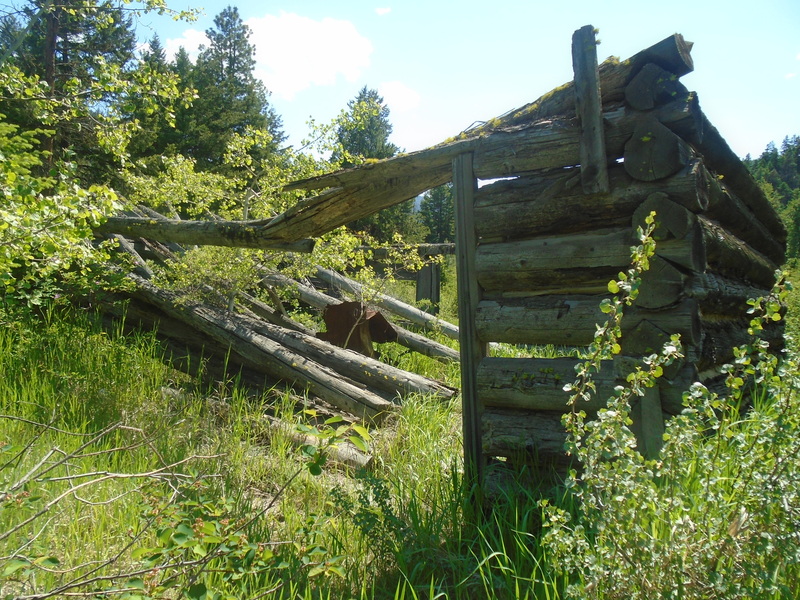 By 1860 prospectors had found gold on the Similkameen and men were soon staking claims. 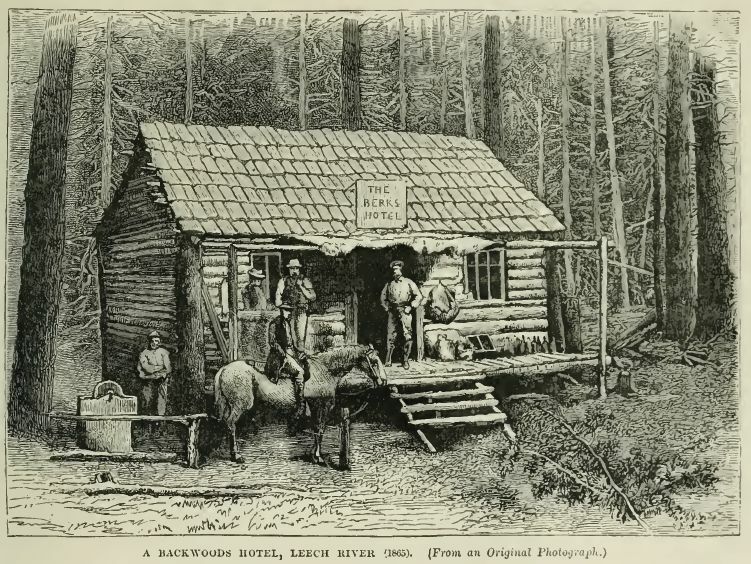 The area experienced a gold rush and a town called Blackwood was created just South of present day Princeton. 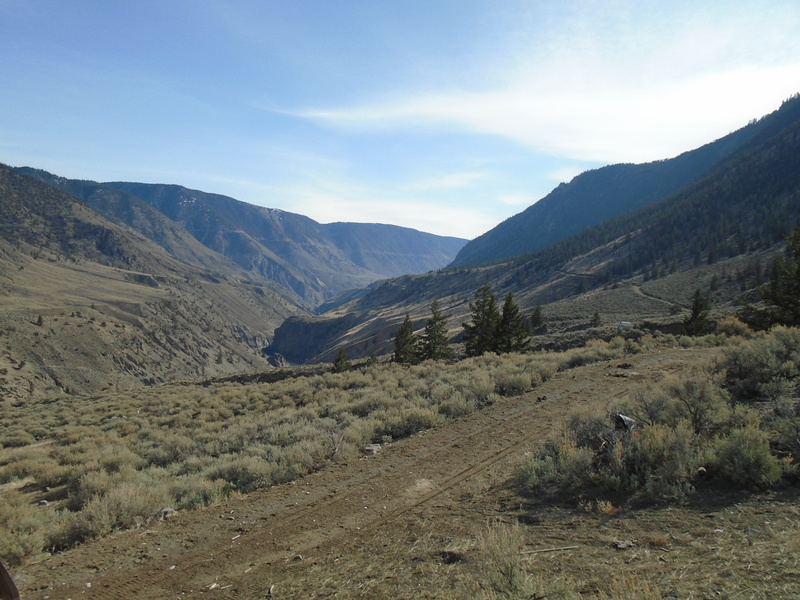 Prospectors descended on the Similkameen again during the Tulameen gold rush of 1885. People have been pulling gold and platinum out of the river ever since. The first day we made the two and a half hour journey from Abbotsford early in the morning. There is a small farm between the highway and the claim. We stopped to talk to the land owner and the refused to allow us to access the claim through their property. 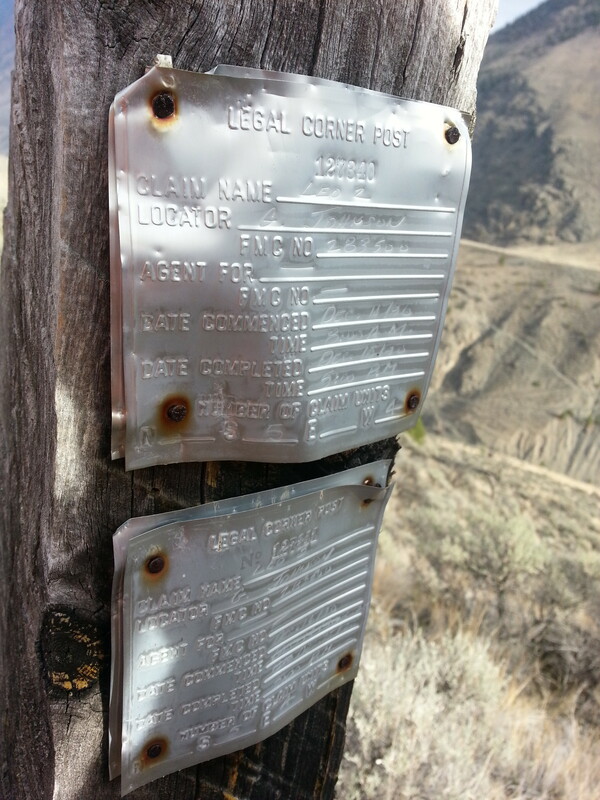 This meant that we had to hike an extra 2km to access the claim without trespassing. We began digging test holes right away focusing on the gravel bars and floodplain above the beach. It was easier digging than expected which allowed us to dig deeper holes to get closer to the bedrock. This area has numerous channels that show evidence of water flowing during the spring melt. The area close to the river is a bit of maze of channels and will take several trips to sample them all. Usually I camp right near the work site on a claim but this time we went for the glamping approach due to the unexpected hike into the claim. We stayed in a historical cabin in Princeton that was built in 1937. 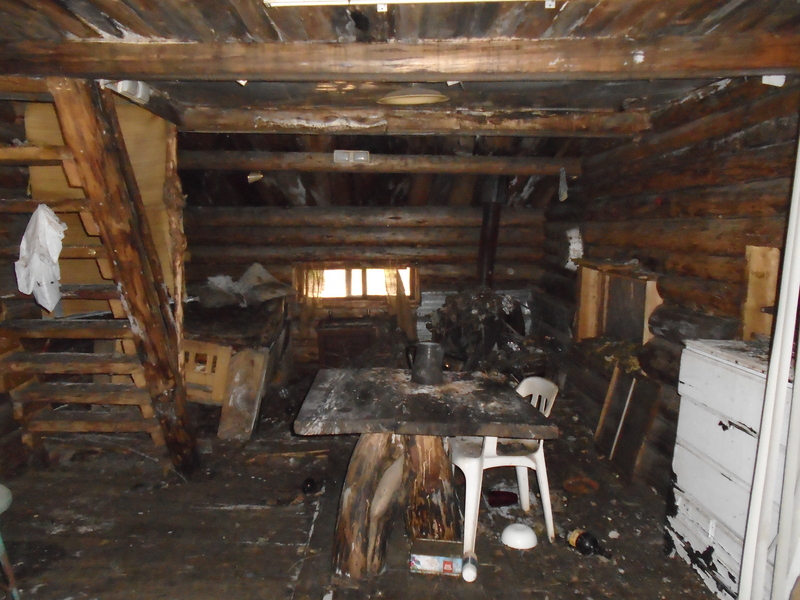 The owners have upgraded the interior over the years with power, hot water and so on but the structure is original. These log cabins only cost $65/night, definitely worth it if you are staying in Princeton. We were at it again the next day covering more ground. 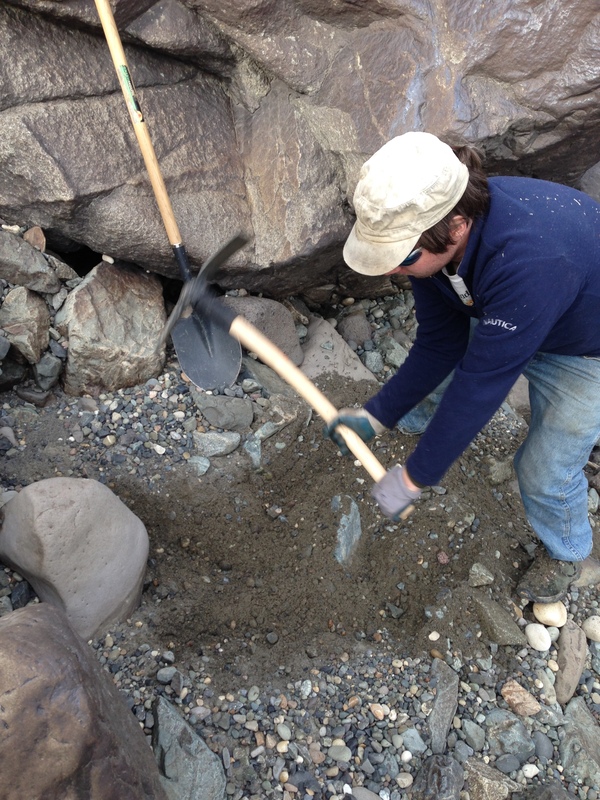 We managed to dig some big holes and take some volumetric samples and lots of gold panning. During the two days we did see some color but no platinum. This area has produced a significant amount of platinum in the past. Searching for a legendary lost gold mine is a little different from a typical prospecting trip. Instead of picking an area based solely on its mineral potential our clues were derived largely from literature and first person accounts from decades ago. It was half treasure hunt and half geological prospecting. Before the first trip we did a lot of research reading up on the legend and accounts of previous explorers of the area. Some background is mentioned in “Part 1 – The Legend”. We also consulted as many topo maps, aerial photos, geological reports and other information as we could get our hands on. It always blows me away how much different terrain can be than what it shows on the map. A topo map can show you several contours close together over 2 or 3 cm of paper but when you get out there it’s a different story. We chose to check out the area around the Terrarosa and Stave glaciers in Southern BC. The legend says the mine is somewhere North of Pitt Lake, and Volcanic Brown’s last camp was found just below the Stave Glacier. In the early 20th century there was a lot activity on Fire Mountain which is just East of that area so we know that gold has been found close by. Geological maps show the boundary between several geological units at a large fault in the valley between the Stave and Terrarosa glaciers and we wanted to check that out. 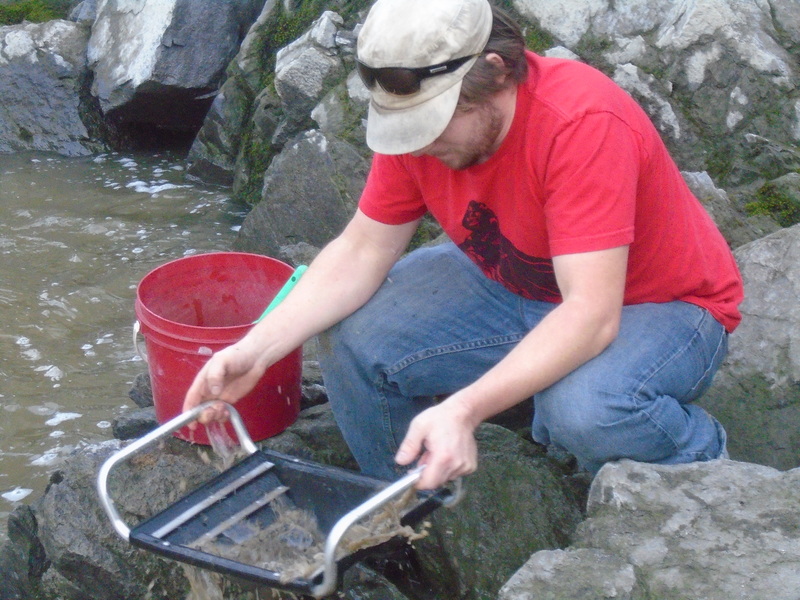 On both trips we took rock samples for lab assay and panned some of the best looking areas. 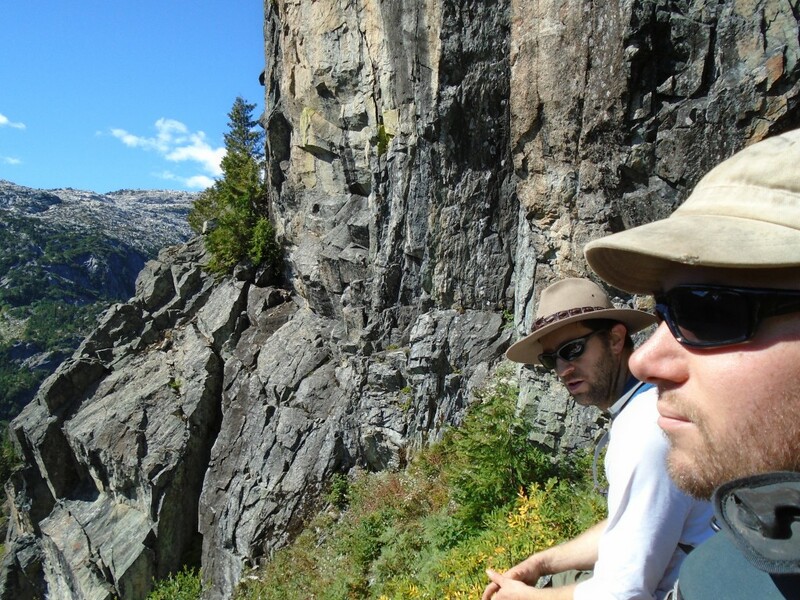 In 2012 we launched the first trip to the area with myself, my brother and a trusted friend. To access the area we travelled up the side of Harrison Lake and took the 4×4 roads up to Fire Lake which is beside Fire Mountain. Several historical high grade hard rock mines are located there. From the end of the road we began our trek to our planned campsite at Terrarosa Lake. The walking distance from the parking spot to Terrarosa Lake was about 17km. Right off the bat we had a very steep incline towards a ridge that would keep us in the alpine as we headed towards the lake. I much prefer alpine over bushwacking up creeks. Its a bit of a push to get up there but no real vegetation to deal with once you do. 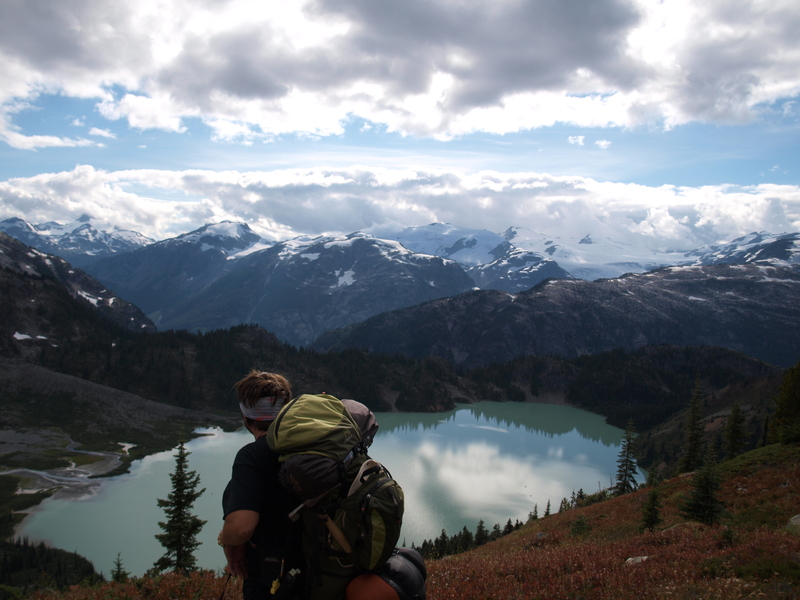 This ridge offers amazing views of Glacier Lake and the mountain peaks all around. You can see several large glaciers from up there. Non stop postcard quality views. It took us two days to reach Terrarosa Lake. We took a pretty sketchy route to an unnamed lake above Terrarosa. 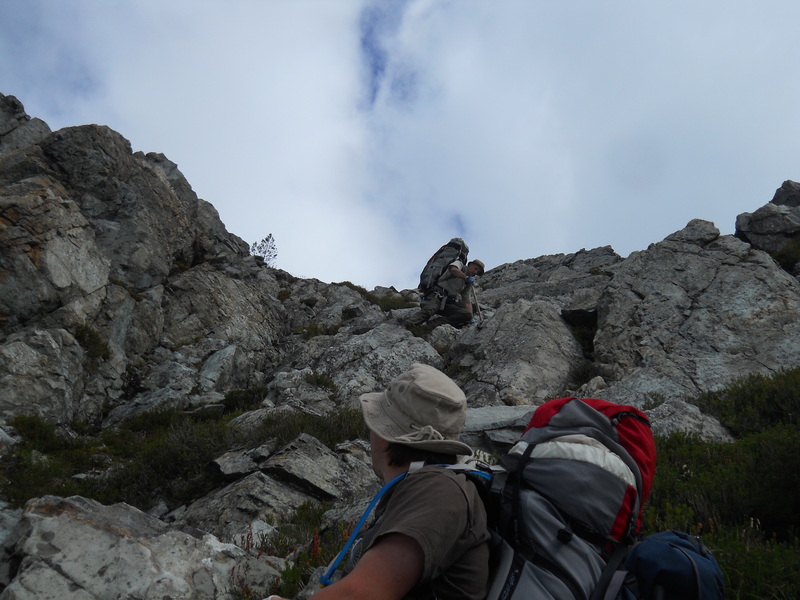 We had to do some rock climbing to get up there which is not easy with backpacks loaded with gear. On the 2014 trip we took a much better route. 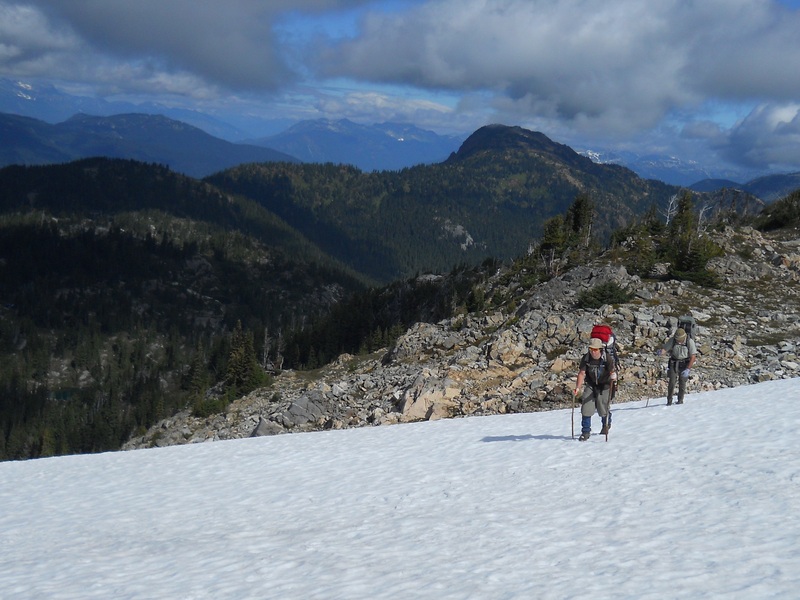 The terrain up there is extremely rugged, you are either climbing a talus field, an insanely steep slope or descending on ice most of the time. Coming into Terrarosa Lake was an amazing sight, perhaps the greatest view I have ever been rewarded with. It kind of reminds me of a job I was on once near Atlin, BC. When the company sent me out there my boss told me it was going to be “scenic” and my co-workers all started snickering. I later found out what they meant. The camp had no showers, no floors in the canvas tents and no toilet, it was beautiful though. Before we reached our main camp site at Terrarosa we had to cross the run off from the glacier. There was no way through without crossing a maze of alder bushes and several knee deep streams of ice cold glacial melt. I always hated alders but after the first trip they will forever be on top of my list of plants that I hate. It was quite a relief to reach the camp. We spent three days checking out the area around the lake and tried to make our way into the valley to the West. Unfortunately we were not able to make it into the valley on that trip. We did find some great samples of mineralized rock but not the placer that we had hoped for. 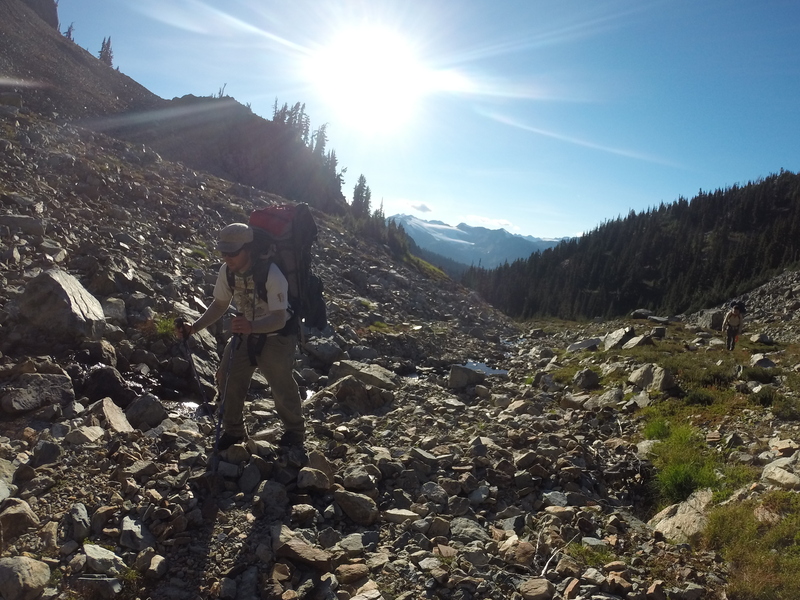 After exploring as much of the area as we could we departed on the two day hike back to the logging road. Once we reached my SUV though we were unpleasantly surprised to find my battery dead. After several failed attempts to bump start it we had to make the 20km hike out to get a boost. It was pretty heartbreaking after 7 days of hiking in some of the roughest terrain there is. 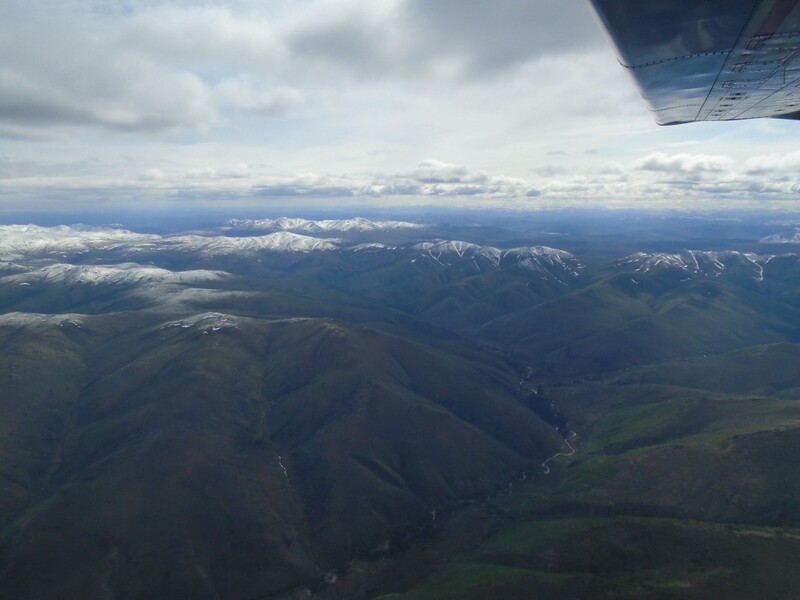 On the return trip in 2014 our primary target was the valley to the West of Terrarosa Lake. On the way up we spent a night at the Sloquet hot springs and had our last real food and beer before the 9 day trek ahead. For backpacking we use the freeze dried astronaut food and other lightweight foods. 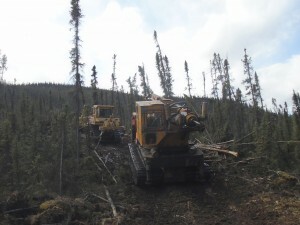 The logging road up to Fire Lake had been fully deactivated since the 2012 trip. There were deep drainages to cross and pushed the limit of my SUV, I bent my hitch somewhere along the way. This time we were more confident in our hiking route as we had learned by trial and error on the previous trip. Instead of camping up above at the lake we moved our camp right down in the valley. It took three days to get in and another three days to get out of the valley and added some even uglier slopes. It also rained for five of the nine days that we were out there which only added to the difficulty. We did have a better planned route though. The valley had some amazing rock with lots of quartz veins and signs of gold. There are several creeks down there that have potential for placer gold as well. We saw several waterfalls too. It was tough going and to reach one of our targets we had to wrestle our way through the worst alder bushes I hope I ever see. They have sideways branches the size of a human thigh filled in with smaller bushes. It was like some kind of cruel jungle gym on a steep mountain slope. We managed to reach all of our targeted spots this time with a few mishaps along the way. At one point my brother had to jump naked into a freezing creek because he dropped his rock hammer. The climb out of the valley was very treaterous. It was almost too steep to walk up, we spent a lot of the time crawling and holding on to vegetation like a climbing rope. There were a couple of close calls but we made it up OK. We hiked back around the lake and set up a camp for the night. It took two more days to reach the SUV again. This time I disconnected the battery to prevent a repeat of the previous situation. After a couple of well deserved warm beers and some clean clothes we hit the road. We took the long way around and stopped in Whistler for one of the most rewarding hamburgers of our lives. The trips we took up into Slumach country were some of the most memorable of my life. The scenery and sense of accomplishment from mastering that kind of terrain will forever be etched in my memory. Both expeditions had numerous challenges but we made it out alive and well. I have everything mapped out in GIS but because of the time, sweat and money investment I won’t post it publicly. Slumach’s curse did not take us yet. As for the gold? I’m not going to give away too much info on what we found up there. I have every reason to believe that the legends are true. Last weekend I went out to check out some claims on Granite Creek. This creek experienced a significant gold rush in 1885. The ghost town of Granite city is at the mouth of the creek, what’s left of it anyway. Our GPS track is below. We took Highway 3 from Hope to Princeton then took the backroads through the Tulameen. 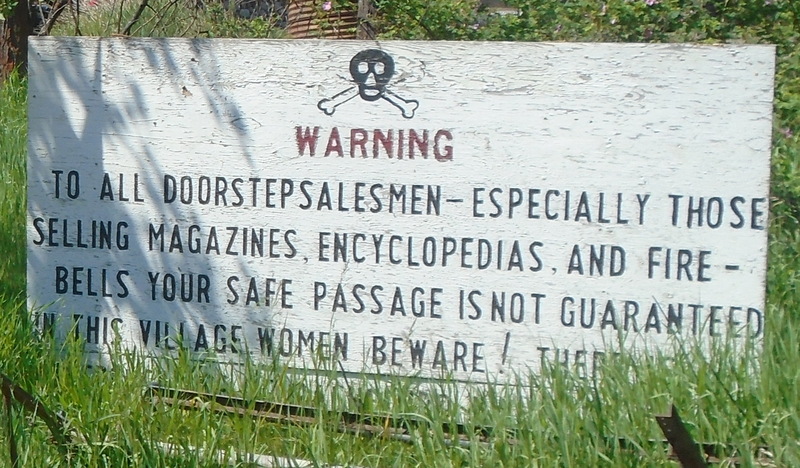 The first stop was the Granite City ghost town, then up Granite Creek to my claims. Later we drove up through the town of Tulameen up the Forestry roads to see Tulameen falls. 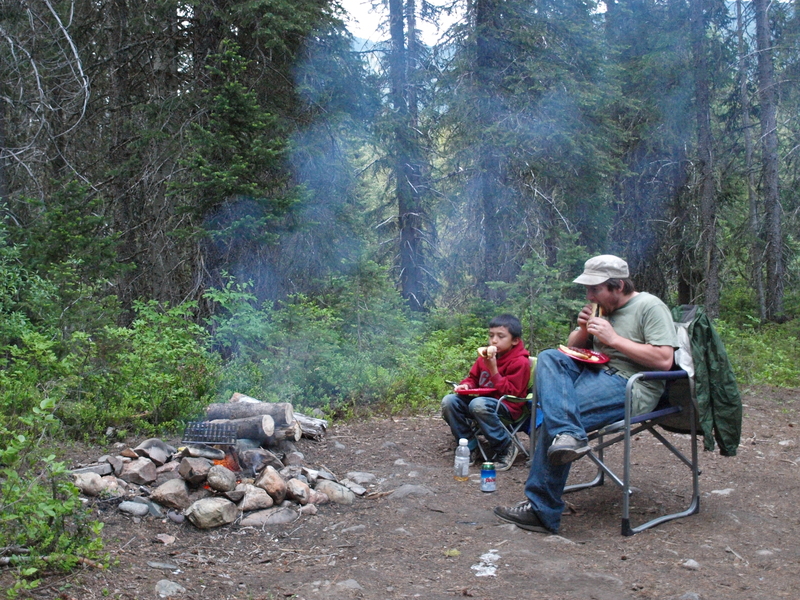 We camped nearby and exited the dirt roads at Britton Creek on the Coquihalla highway. We checked out the Othello tunnels on the way home. The whole trip was approximately 470km. My 8 year old son accompanied me on this trip because he had a geography report for school and decided to do it on the history of this area. We passed through the hamlet of Coalmont on the way to Granite Creek. There’s not much there except for a couple of streets with some old buildings and these funny signs. I had been waiting a long time to check out the Granite City ghost town. It was quite a large city at the height of the gold rush. There were over two hundred buildings, 13 of which were saloons. The bars in Granite ran flat out 24/7. This was a real frontier town with all the ingredients for a great western movie, gunslingers, gamblers and prospectors. With a population of over two thousand in 1885 Granite City was the third largest city in BC, even larger than Vancouver at the time. There are many stories about Granite City, such as the lost platinum cache. It is interesting that the tributaries of the Tulameen, including Granite Creek, are one of two places in the world where both platinum and gold are found in the creeks. The other is the Amur river in Russia. At the beginning of the gold rush in this area the miners were collecting platinum in their gold pans and rockers but they didn’t know what it was. Platinum is very dense and will sit in the bottom a gold pan the same way gold does. I have found platinum in my pan before and it took me a couple seconds to realize what it was. Most miners kept their platinum but many threw it away with their black sands. The lost cache legend states that a prospector named Johannson collected platinum from the miners and build up several tin cans full. He apparently buried his cache within sight of the front door of his cabin with the intention of returning to collect it. He was never heard from again. At any rate there is not much left of this gold rush town today. There are a handful of cabins in various states of decay, a monument and a graveyard. My claims are about 17 kilometers up the road from the old townsite. We took the Arastra creek forest road up to the confluence of Arastra and Granite creeks. I met a local prospector while we were up there and he told me Arastra creek got its name because the chinese miners built a large water wheel crusher called and Arastra. The claims that I have are not directly on the water so we had to bring our samples to the creek to pan. It was very labor intensive. 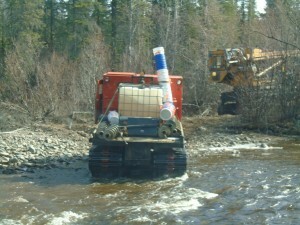 One claim was right off the road so we were able to use my truck to drive the buckets of gravel to the creek. The second claim required that we hike along Granite creek on a very old trail. While hiking along the 2km section to my claim one can’t help but imagine what it would have been like out here in the 1880s. There was evidence of old camps and such all along the way. 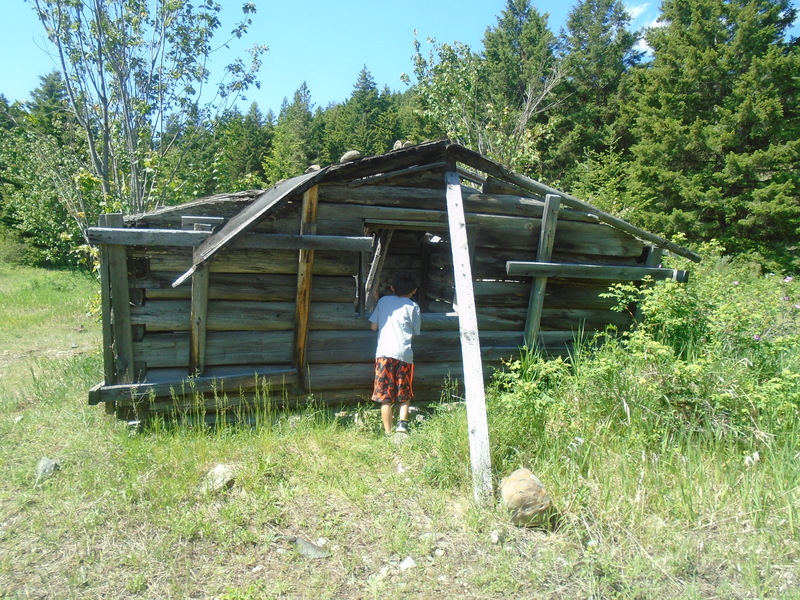 We even found an old miner’s cabin that had long since been deserted. We managed to get a few samples of 20L each. 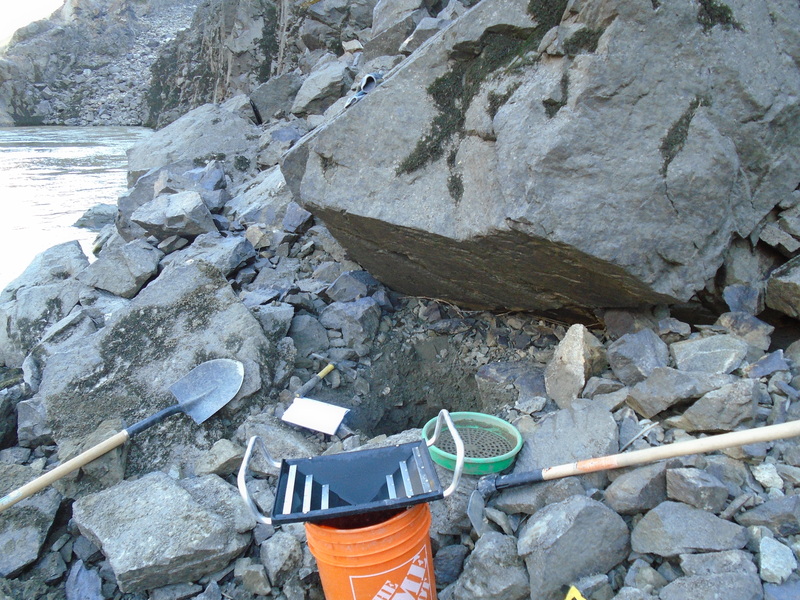 I concentrated the samples on site with my pyramid pan so I only had to hike out with 1L bags. We did a few test pans around the area and saw some color. No platinum though. After finishing the work on my claims we packed up our camp and headed up the Tulameen to check out an awesome waterfall called Tulameen falls. 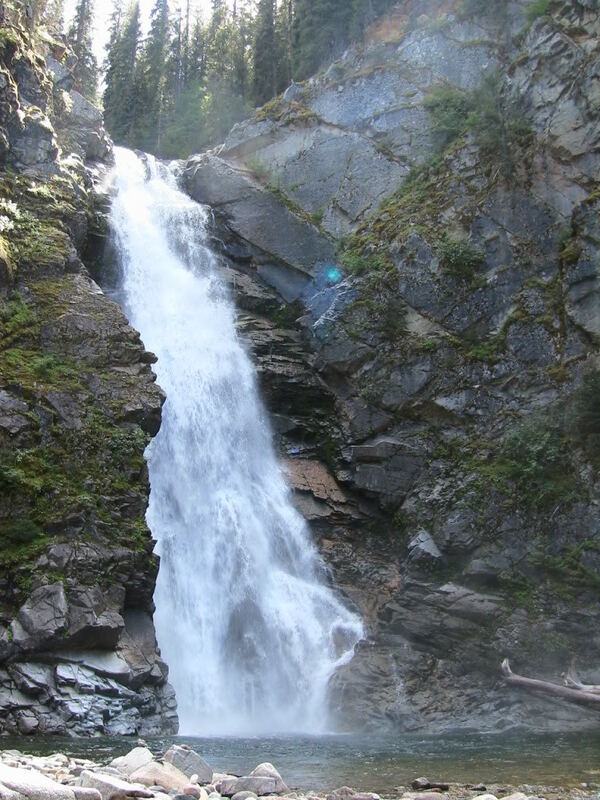 The waterfall is located approximately 30km up the river from the townsite of Tulameen. The Similkameen tourist pamphlet that we picked up in Princeton said the waterfall is accessed by a 1km moderate hiking trail with two river crossings. That doesn’t sound too bad. When we got to the trail head it looked like nothing was there it seems that a forestry operation has moved the road an piled banks of large rocks over the old recreation site. We found the trail marked by spray paint on a tree. The first part was not too bad, then we crossed the river in our bare feet to keep our boots dry. There were signs to only cross in low water but it seemed low enough. The water was up to my mid thigh but a lot higher on my son. After that the trail was pretty bad with some sections of no trail at all. It looked like it was a well maintained trail once but must have been hit with a flood or something. The waterfall is amazing, it has over 1400 feet of drop and a lot of water pouring over it. 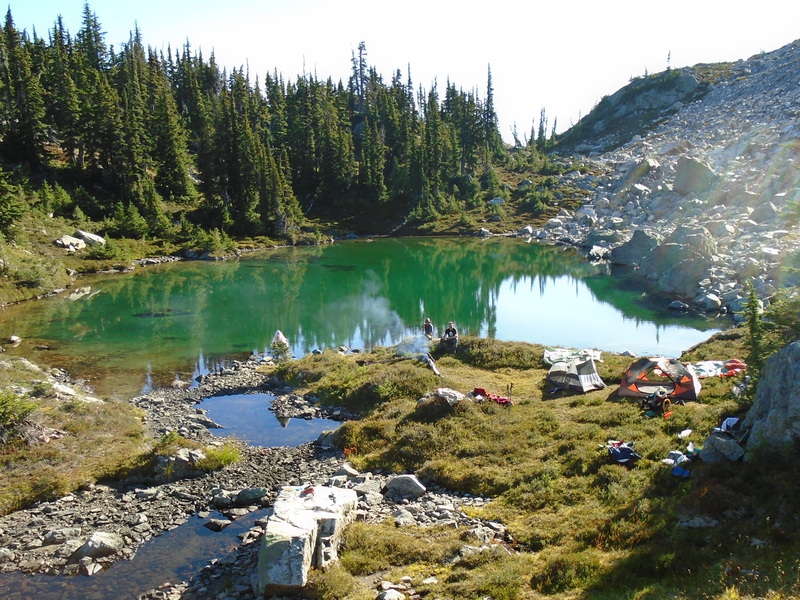 We found a really nice free camp site a few kilometers up the road from the trailhead. It is called Sutter Creek Recreation Site. After staying the night we headed back to civilization with one more stop on the way. We checked out the Othello tunnels just North of Hope. 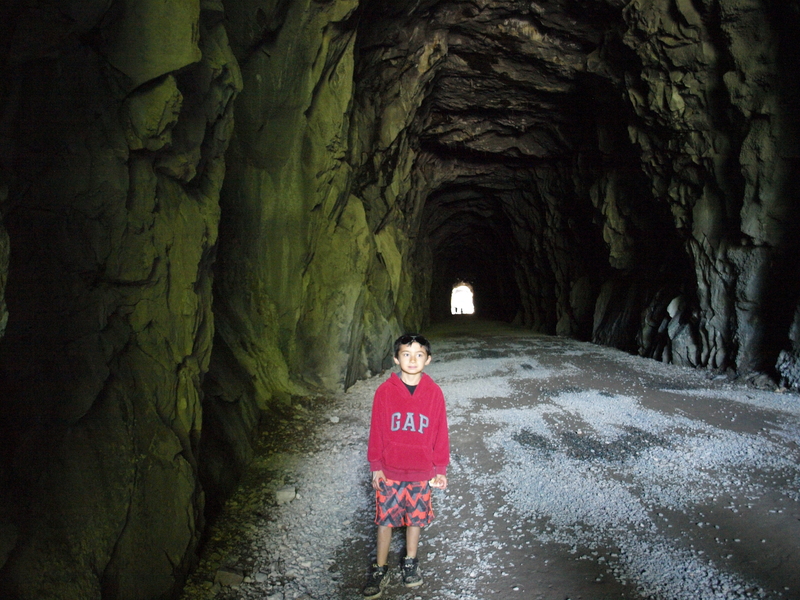 These tunnels were part of the old Kettle Valley railroad. The KVR was a steam railroad the serviced the region from Hope to present day Kelowna. 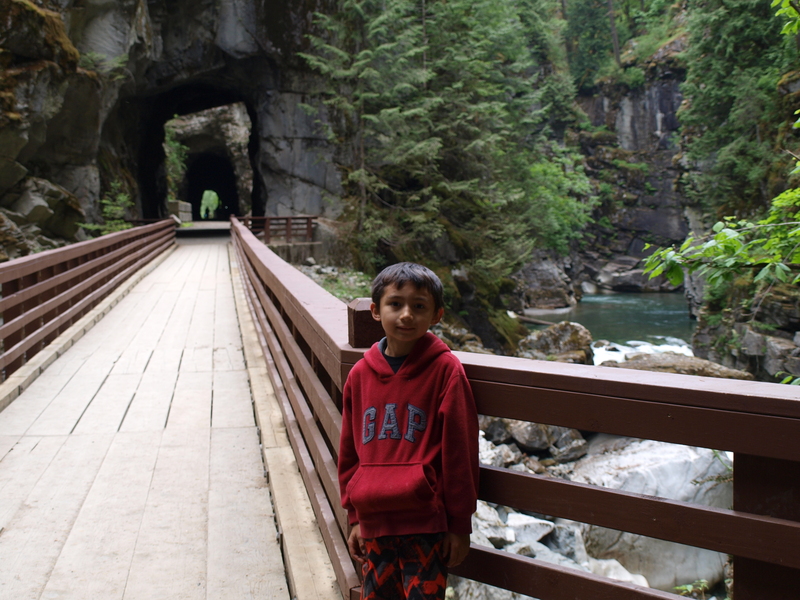 There are five tunnels close together and several bridges to make it possible to access this section of the Coquihalla canyon. Apparently the lead engineer was a Shakepeare nut and named several of the stations after characters from Shakepeare plays. There were Othello, Romeo, Juliet, Lear, Jessica, Shylock and Portia. Overall it was a great trip. 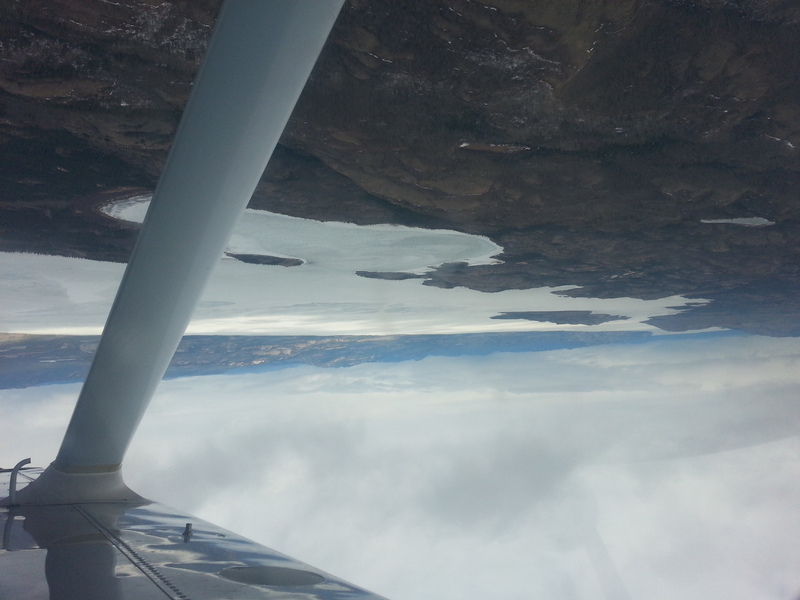 We did some initial sampling on two claims and saw some cool parts of Southern BC. I have other claims in the area and will be back soon. There’s something about the Tulameen that gives an eerie feeling when you are out there. It could be the remoteness or the history of the area. Maybe its the platinum, whatever it is I like it and can’t wait to explore the region in the future.